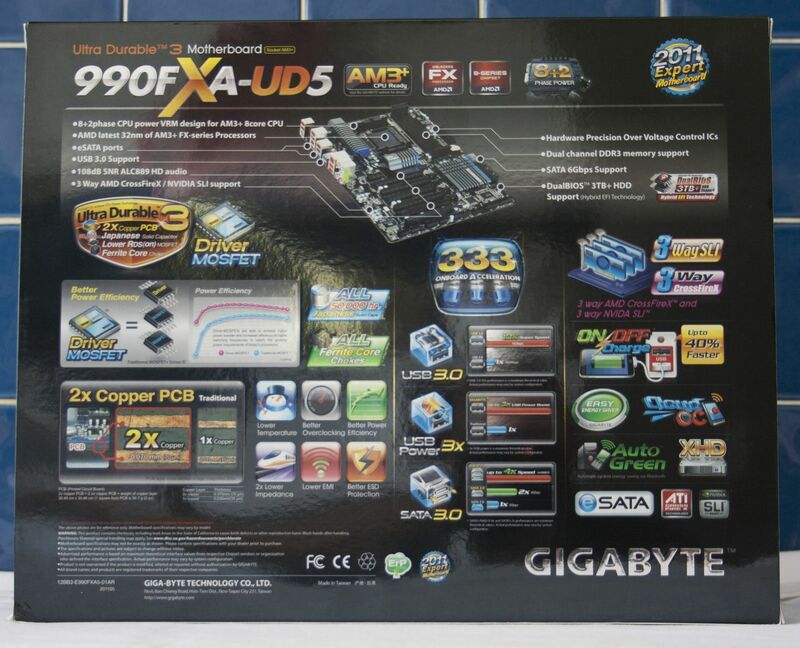 Gigabyte’s new GA-990FXA-UD5 motherboard has just been delivered to me and I have to say it looks pretty impressive. Detailed specifications can be found here: http://www.gigabyte.com/products/product-page.aspx?pid=3891&dl=1#sp so I won’t bore you with all those details. 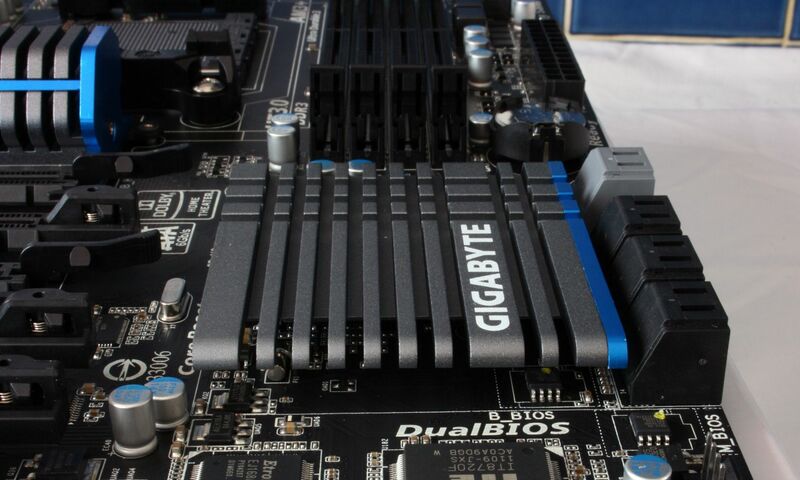 Suffice it to say that this board sports the new black colour scheme of Gigabyte’s higher end motherboards, is AM3+ ready, for when AMD releases the new Fusion FX (Bulldozer) CPU’s and has the latest 9 series chipsets from AMD. It also supports 3 way Crossfire and SLI support, something which hasn’t always been available on recent AMD motherboards. The box is covered with the usual logos and is actually printed in a dark green colour (apologies for the poor photographs which make it look black). 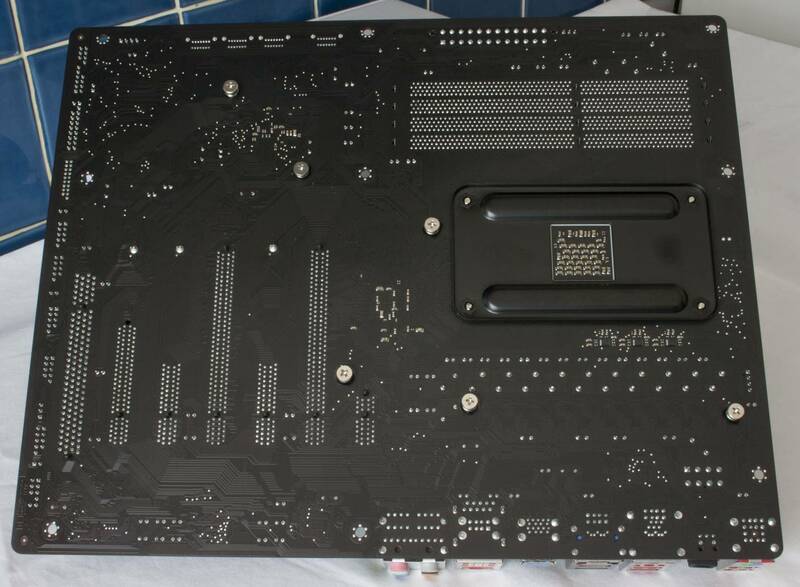 When you open the box you find 4 black SATA leads, a 2 way and a 3 way SLI connector (if you use ATI Cards the Crossfire connectors usually come with the graphics card), User’s Manual, Quick Start manual, Backplate and a couple of stickers. 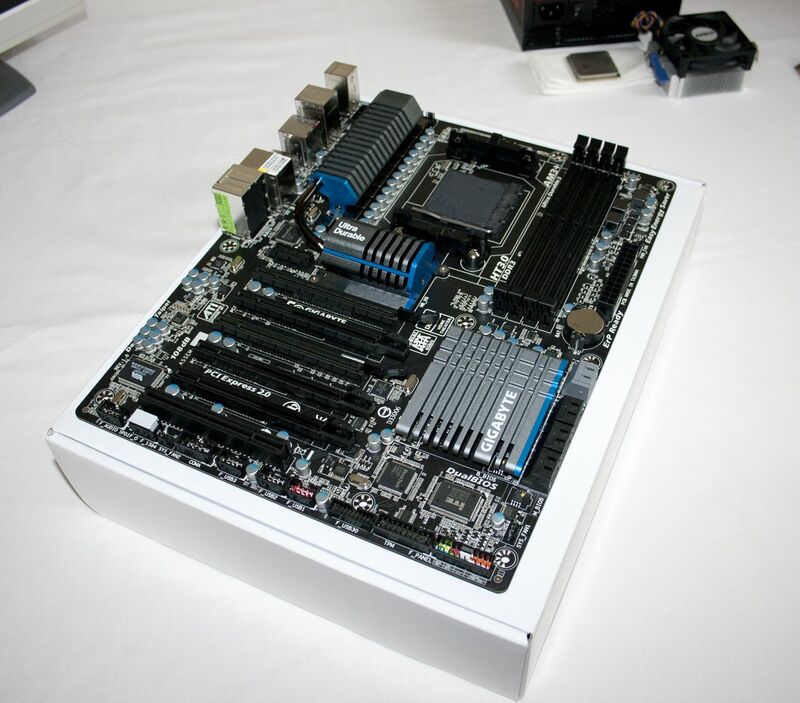 The motherboard itself looks very impressive. The Northbridge and Mosfet coolers are of a slotted design and are linked with a heatpipe to transfer heat more efficiently. The AM3+ Socket is black and there is a new design for the Cooler bracket which now runs down 2 sides of the CPU rather than the large rectangular box design previously seen. 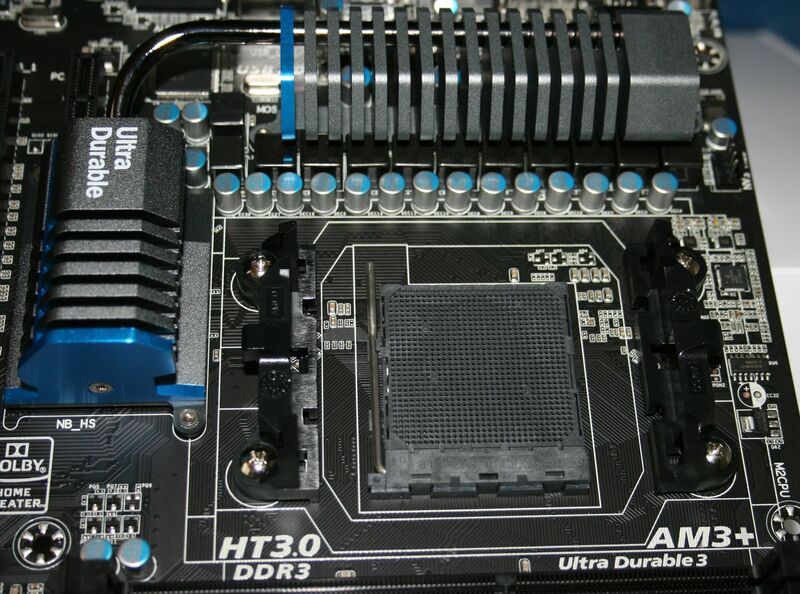 Once, again, this design tweak is to aid cooling and to improve airflow around the CPU socket. The first thing that I really did notice on this board is just how low the profile is for the Southbridge cooler. 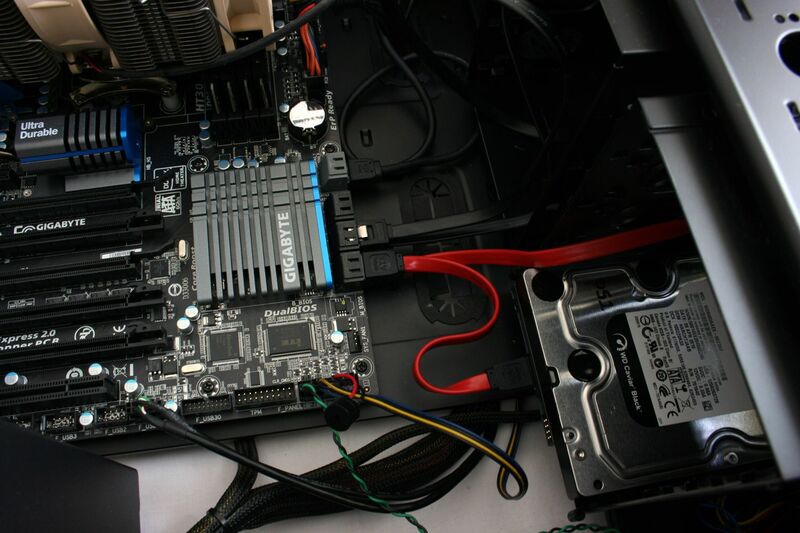 It is so low, in fact, that it actually sits below the SATA ports on the edge of the board. The new design for the Mosfet Cooler has allowed for easier access to the 8 Pin 12V power connector socket. and this was too long. 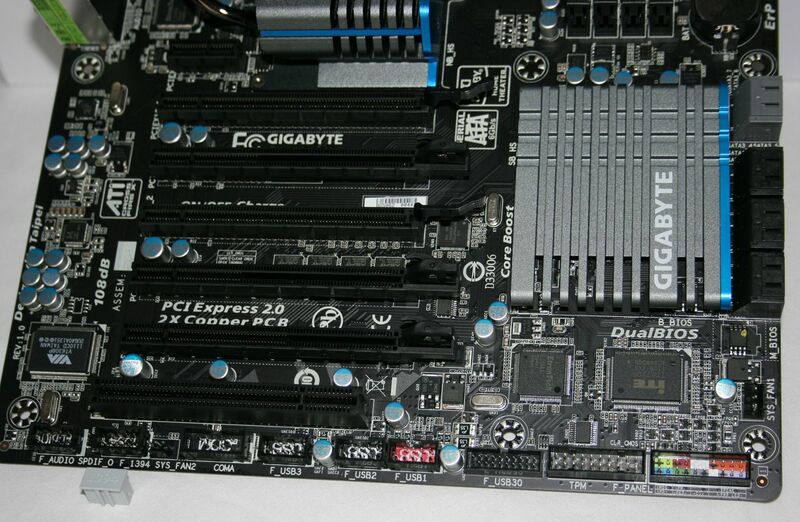 I’m not sure which PCIEX1 cards will actually fit this slot and it could be an issue for some users. 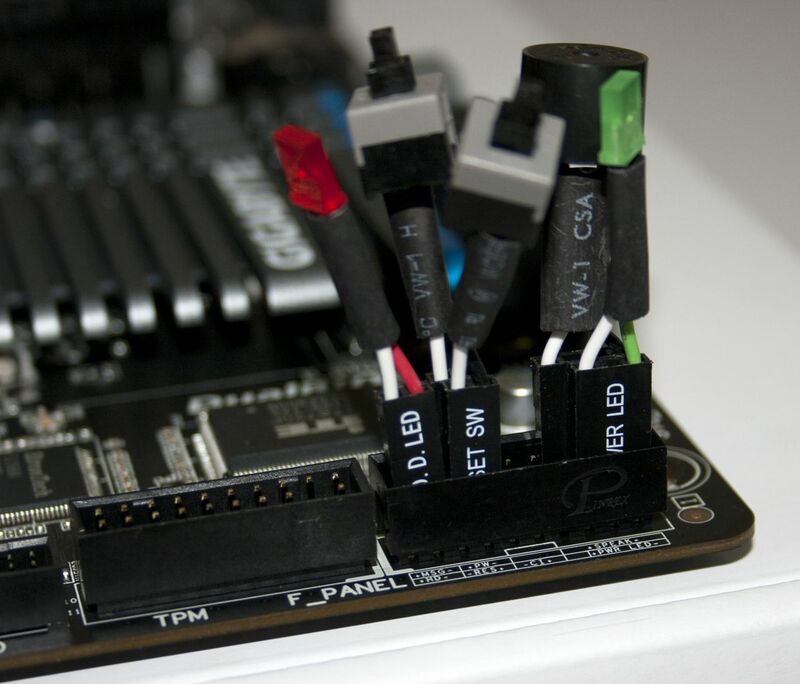 The SATA ports are placed on the right hand edge of the board. 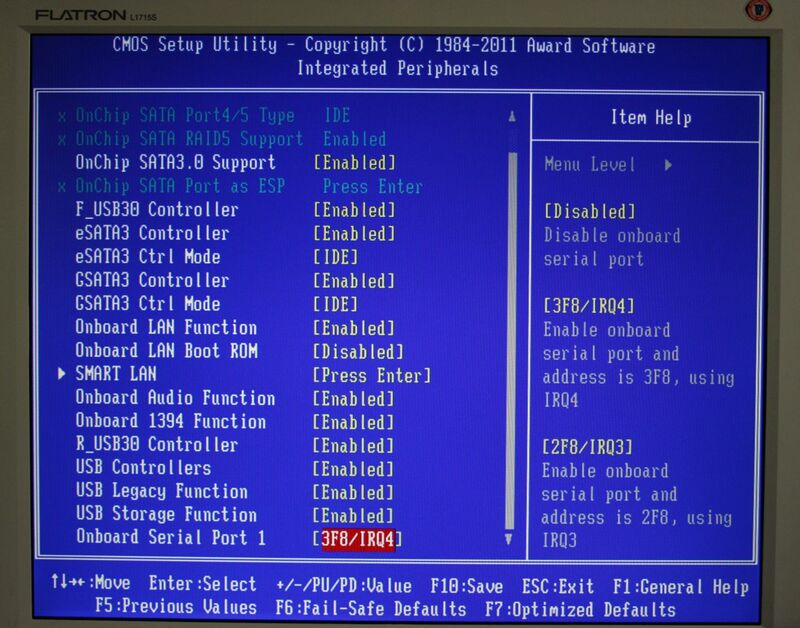 The 6 black ports are controlled by the AMD SB950 Chipset whilst the 2 grey ones are controlled by the Marvell 9172 Chipset. The backpanel follows the standard layout and has a plethora of USB ports. 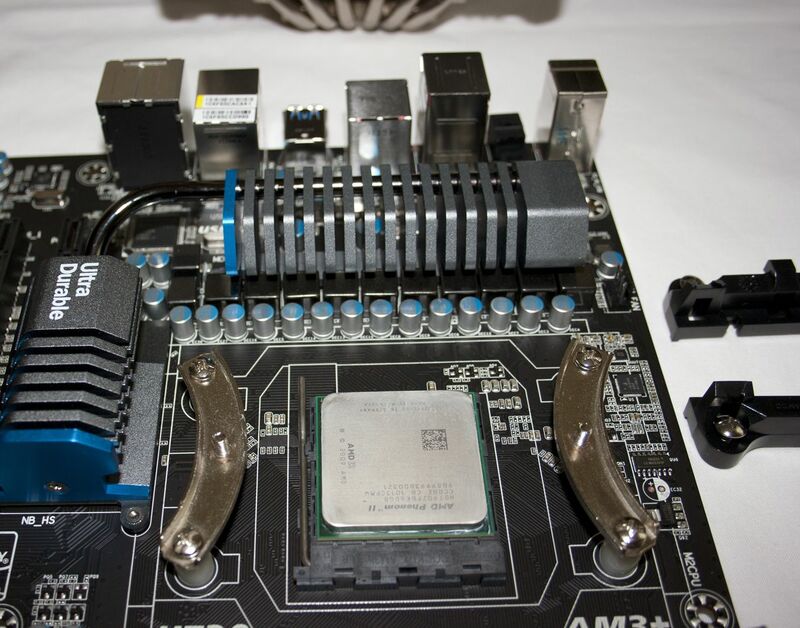 The back of the motherboard is clean and tidy and the backplate for the CPU cooler mount is made from black metal. 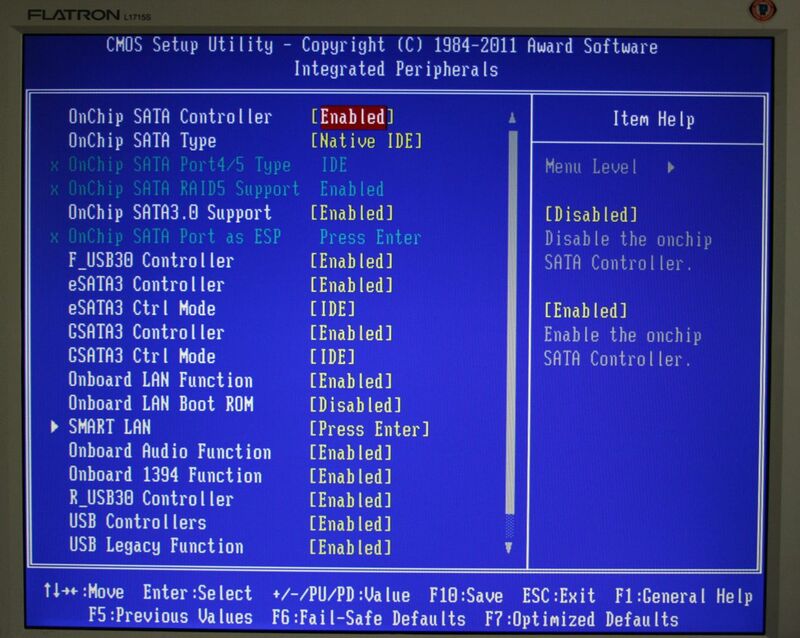 Unlike the GA-890FXA-UD5 that I have been using, this board lacks certain features. 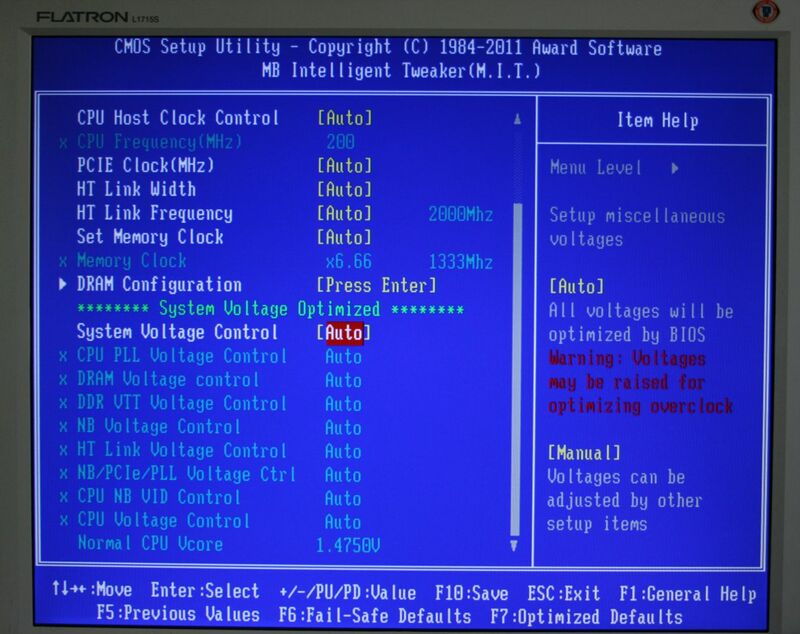 For example, there are no Power, Reset or Clear CMOS buttons. It also has only one LAN connector which although not a big issue to me, does make one wonder why they have not been included. 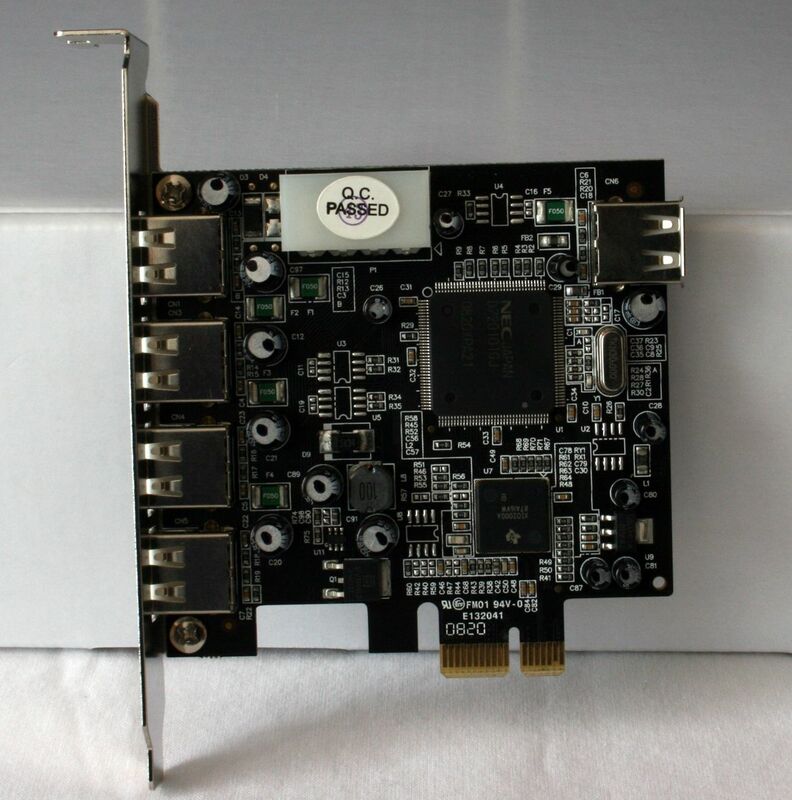 This board also lack the Coaxial S/Pdif connector that the GA-890FXA-UD5 had, although it does retain the Optical S/Pdif output. 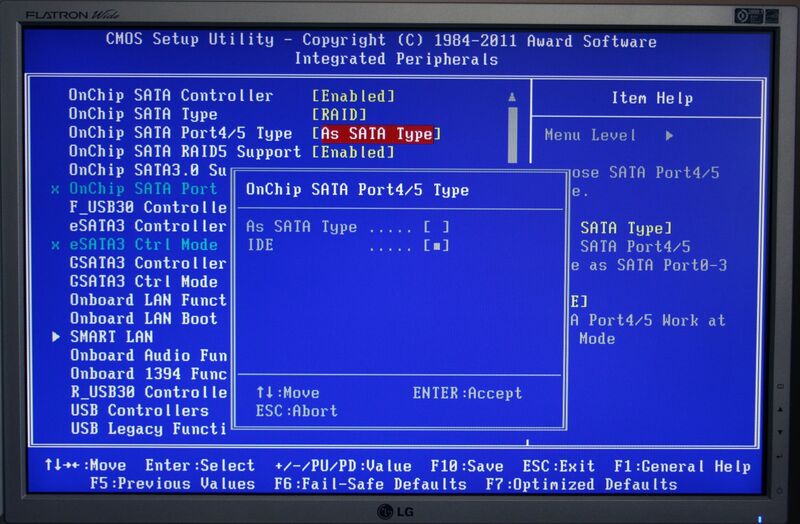 Also, there is no longer an IDE or Floppy header, so this board is SATA only, if you have any older hardware that uses these connections you will have to replace them. So, there are same major changes with the hardware that this board packs over the GA-890FXA-UD5. However, the inclusion of SLI support is something that many users will be pleased to see along with the new AMD 9 Series chipset. 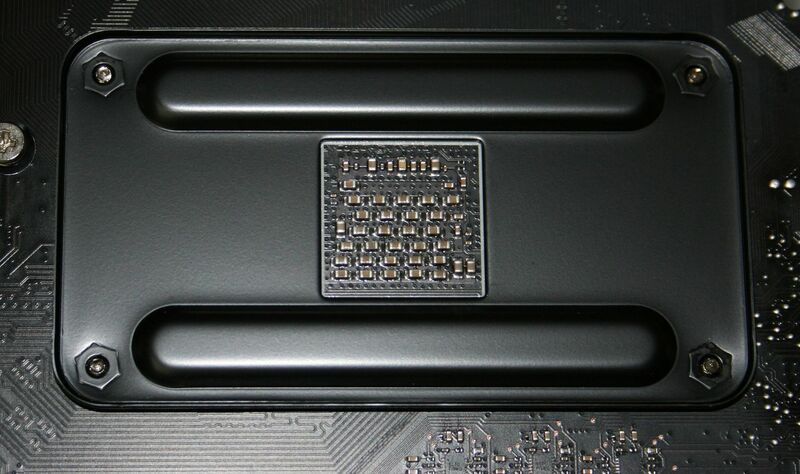 In some ways, at first glance, this board seems like a step backwards but, and it is a big but, this board has been designed for the new AMD AM3+ Fusion FX (Bulldozer) processors, when they come along and, as such, we shouldn’t be too critical of what seems to be lacking. So we have got our new motherboard and possible a lot of other new parts too. The usual thing to do is throw everything together, press the power button and pray. But, I have learnt the hard way that, although things will usually work if you do that, it is much better to add another step first. This is particularly important if you are not sure of what you are doing or if, as in this case, the motherboard is of a new design and there is nowhere to go if you run into problems! The first thing I do now is lay all the parts out on a clean work area. Make sure you have all of the parts you are going to need so that you don’t have to rush around and find something. As you will see from this image, I have a set of switches, HDD activity and Power lights and a small motherboard speaker. I use these as I have found them a real boon but you can use the connections from your PC Case, you’ll just need a little more space. Place the motherboard on a cardboard box. The one the motherboard came in is ideal. 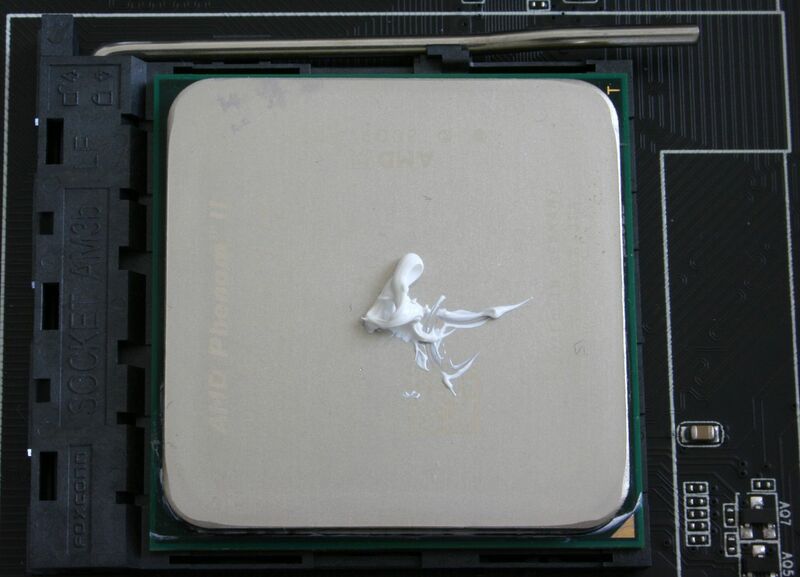 Mount the CPU and add a little thermal paste. You only need a small amount of thermal paste, about a 3-5 mm bead. 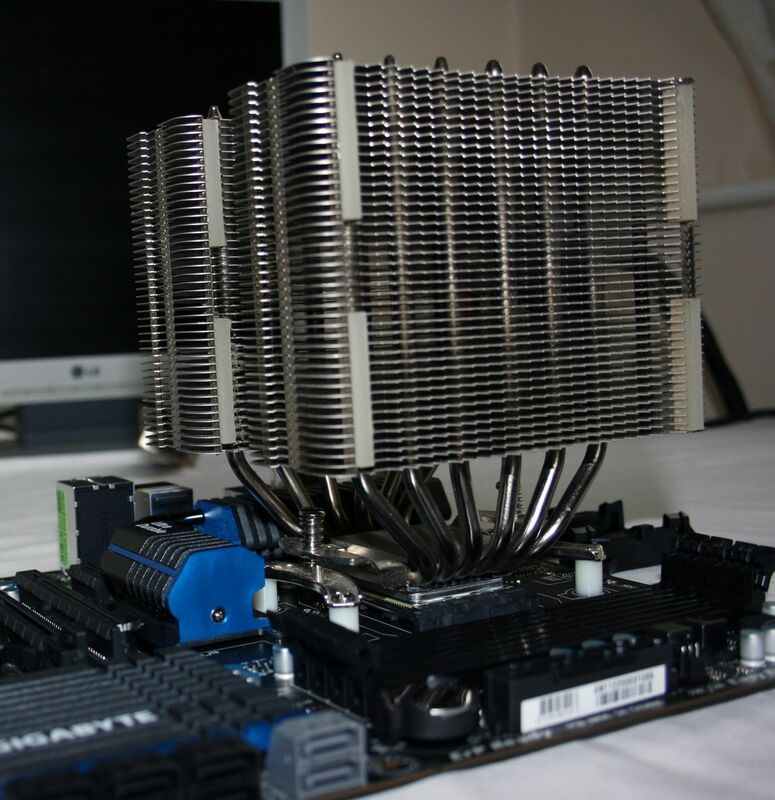 You don’t need to spread this out as the weight of the CPU cooler will do this for you. The CPU should just drop into the socket and, if for any reason it doesn’t do so, do not try and force it in. First make sure that the lever at the side of the socket is raised. If it is and the CPU still won’t fit, carefully examine the pins of the processor as it is possible to bend these if you handle it roughly and that will stop it from just dropping into the socket. 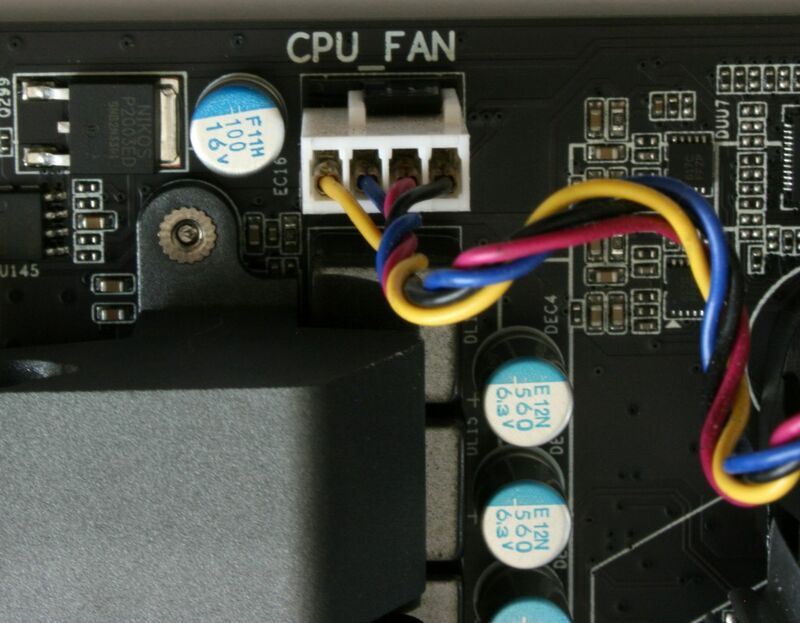 Mount the CPU cooler and attach the CPU Fan lead to the CPU fan header on the motherboard. 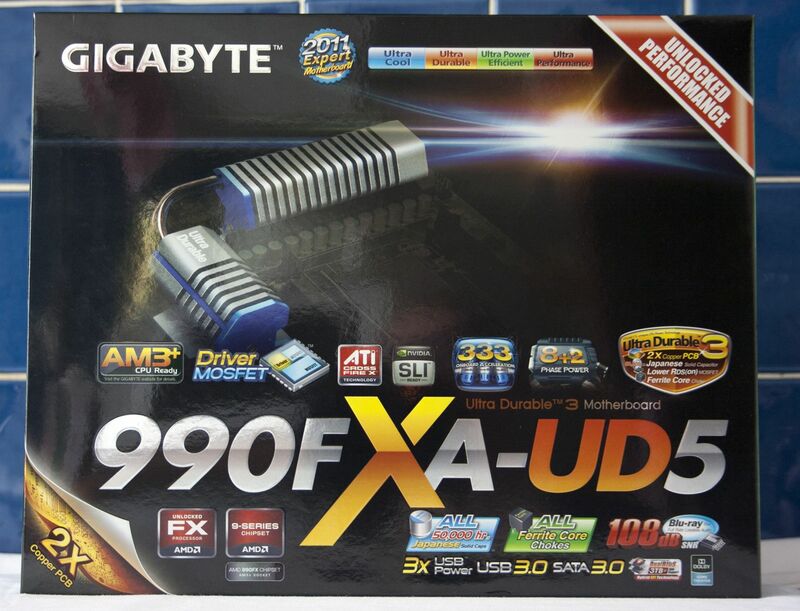 Add one stick of RAM, make sure you put this in the first slot. You will need to check your User’s Manual for the correct slot and on this motherboard the first slot is now the one furthest away from the CPU rather than the one nearest to it. 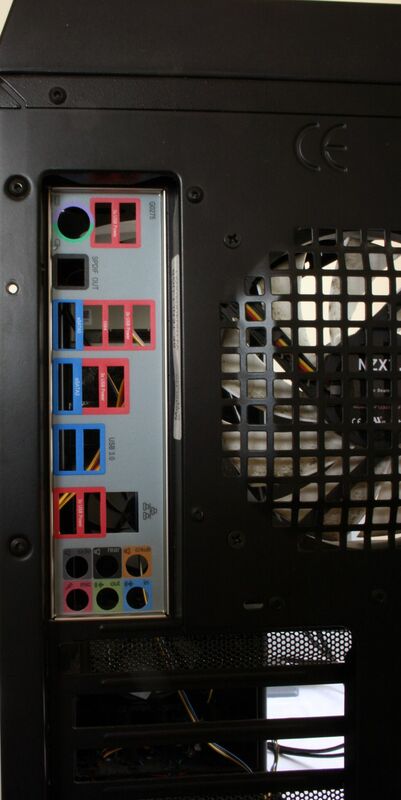 Add your Graphic Card to the slot marked PCIEX16_1. Connect the Power and Reset switches along with the motherboard speaker and Power LED, to the motherboard header. Again you need to refer to the User’s Manual for the correct configuration. Connect the 24 Pin ATX power lead. 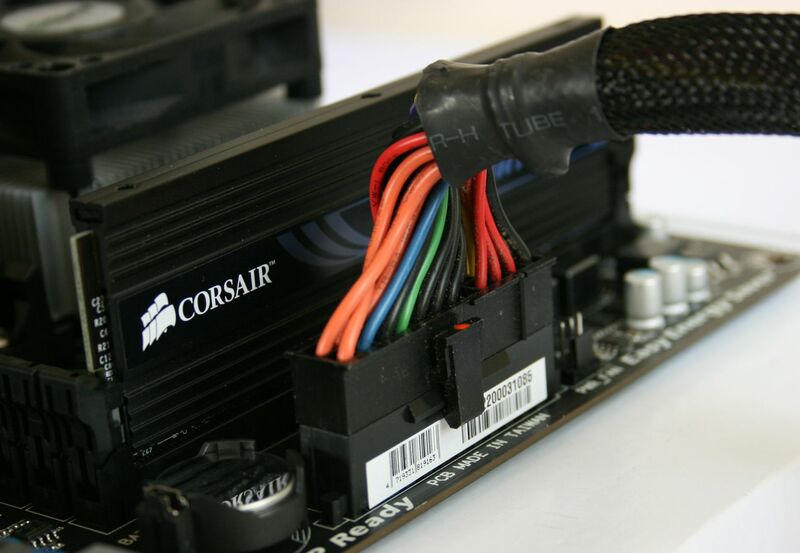 And the 8 Pin ATX 12V connector. 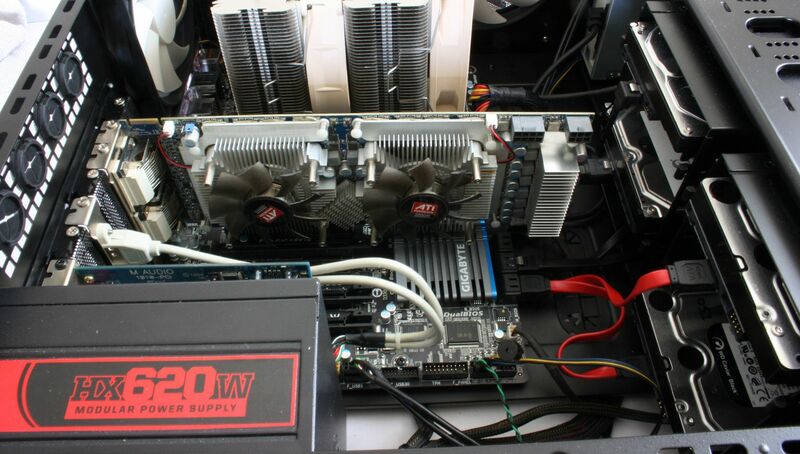 If your Graphic Card needs additional power make sure that you connect those lead(s) at this stage. Connect the Monitor lead to the Graphic card and also plug in your keyboard. You don’t need a mouse at this stage and, although I prefer to use a P/S2 keyboard you can use a USB one. And that’s it we’re now ready to power up for the first time. Make sure that everything is switched on at the mains and that the power switch on the Power Supply is also switched on then press the Power Button. If everything is working as it should then you should hear a single beep from the motherboard speaker, the monitor should spring to life and you will see the Gigabyte Splash Screen appear. 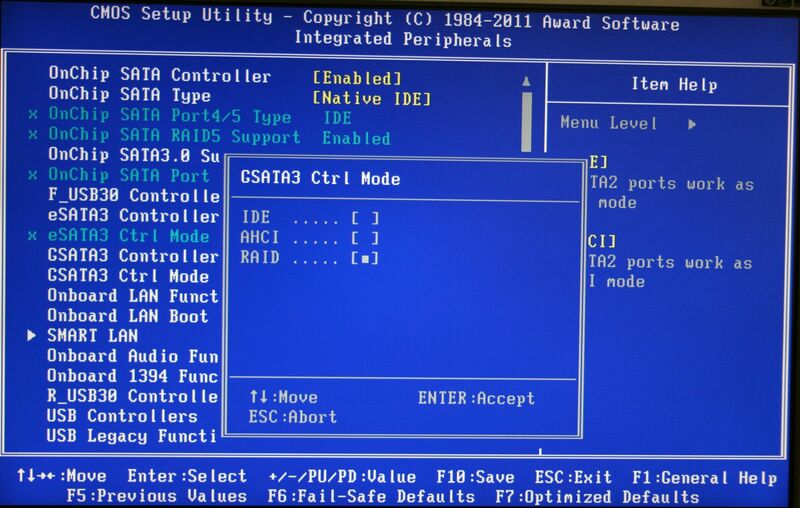 Press the “Del” button on your keyboard and you will enter BIOS. If you press F9 on your keyboard when you are at this screen then another small window will open giving you more detailed system information. 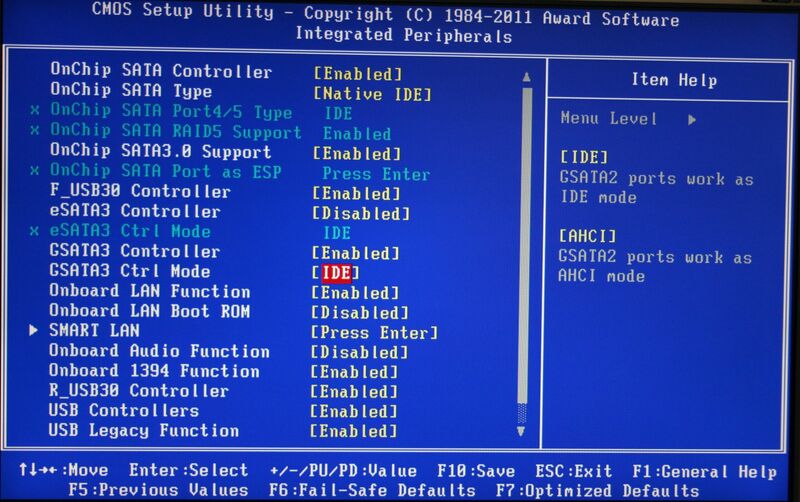 You can, if you want, go through BIOS and check everything out, I usually make a couple of minor changes at this stage such as Disabling the Full Screen Logo and setting the Init First Display to the correct port, in this instance that is PEG. 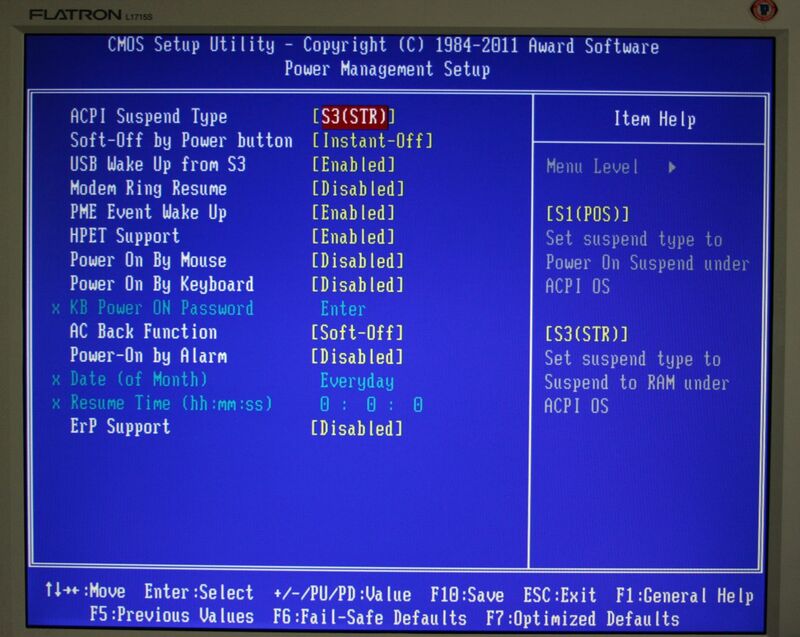 Once you have made any changes you wish to make press the F10 key, save the changes and the PC will reboot. It will then stop and your screen should show you…. This is normal and absolutely nothing to worry about. We haven’t installed the hard drive or operating system yet, but we now know that the PC works with the basic components. Any problems we may now face will be easier to track down. Now we have tested the basic components and are happy that everything seems to be OK it is time to actually build the PC inside the case. I should mention at this stage that if you are using new RAM it is a good idea to test it during the previous build phase, just to make sure there are no faulty modules! 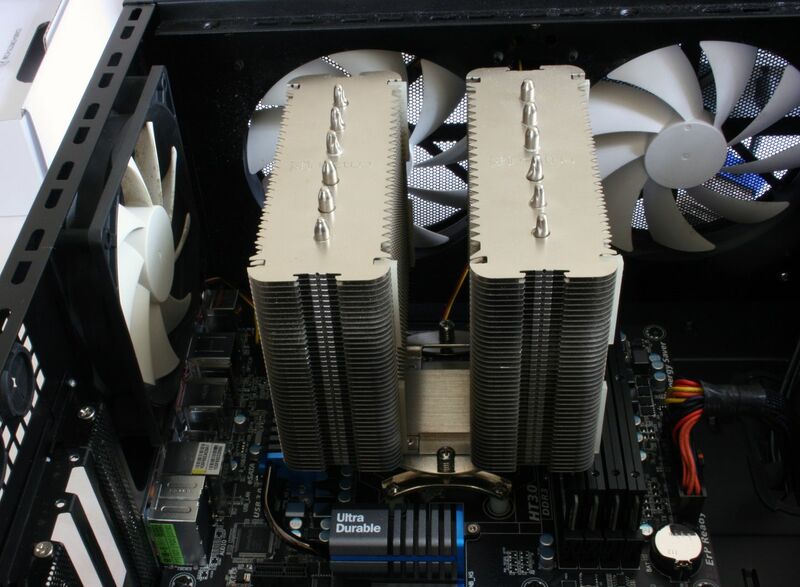 As I am using a 3rd Party cooler I need to change the CPU Cooler mounts. This is a relatively simple process of just unscrewing the existing mounts and replacing them with the new ones. Once you have swapped the mounting brackets you can pop your CPU back into the socket as it is safer there than on the workbench. The Noctua NH-D14 is one of the larger Air Coolers and it is a good idea to place the cooler in position to check clearances, especially around the Mosfet Cooler and RAM slots. At this stage you do not need to fit the cooler or add Thermal Paste as we are just checking that you will be able to fit your other parts. 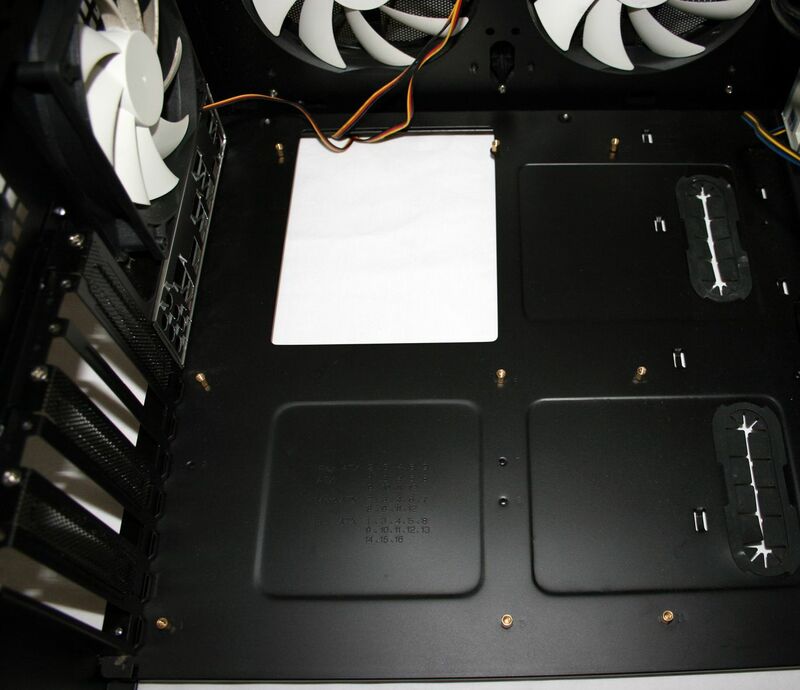 Insert the supplied Backplate into the PC case. These are usually made from thin metal and can be easily bent out of shape so you need to be a little bit careful. Make sure that you press firmly around the edges of the Backplate to ensure it sits home properly. Make sure the motherboard stand-offs are positioned correctly for the motherboard and that there is nothing left lying where the motherboard will be placed. Position the motherboard into the PC case so that it sits properly against the backplate and make sure the screw holes line up correctly with the motherboard stand-offs. 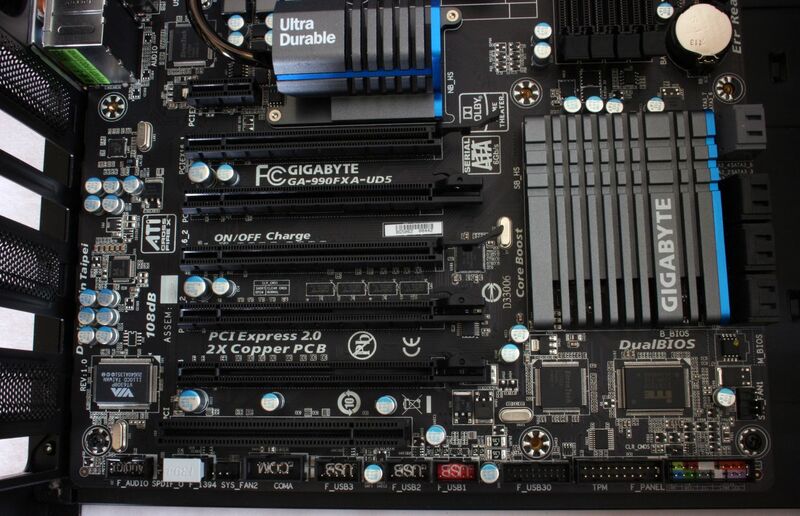 It is a good idea to use a screw in each corner at the beginning to hold the motherboard in place. Don’t tighten them fully at this stage as you may need to tweak the position of the motherboard to line up all the holes properly. When you’re happy that everything is in position tighten the screws and then add the remaining ones. 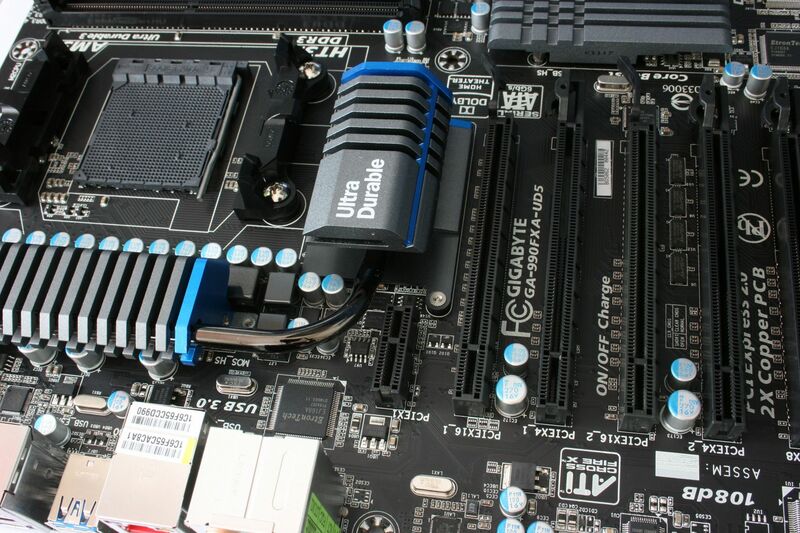 Do not over tighten the screws as too much pressure could damage the motherboard. 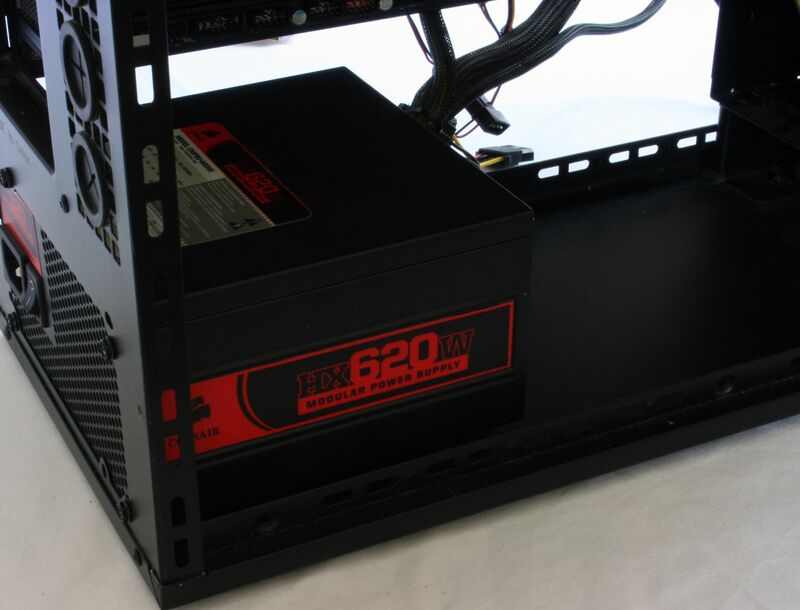 Then add the Power Supply (PSU) making sure that you tighten the screws fully to hold it in place. Then connect the 24 pin ATX and 8 pin 12V power connectors. This helps with the main cable routing and allows you to check that the power leads are long enough before you get too far into the build. Add the Cables from the PC case to the motherboard headers. Doing this at this stage is easier than trying to connect the cables when everything else is installed and space can become a little limited. 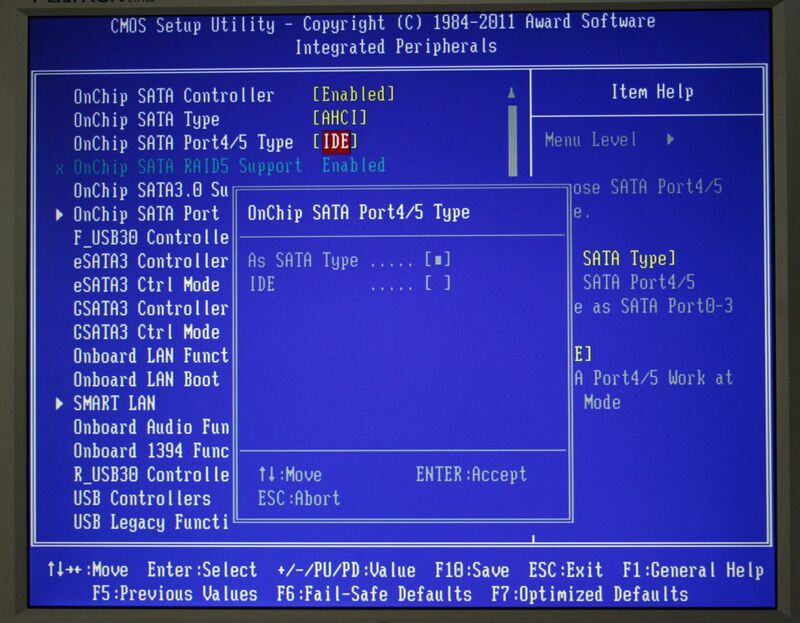 Insert your RAM modules following the User’s Manual to make sure you use the correct slots. In this build I am using 4 sticks of RAM so this is not an issue but if you are only using 1 or 2 RAM modules it is important they are installed correctly. 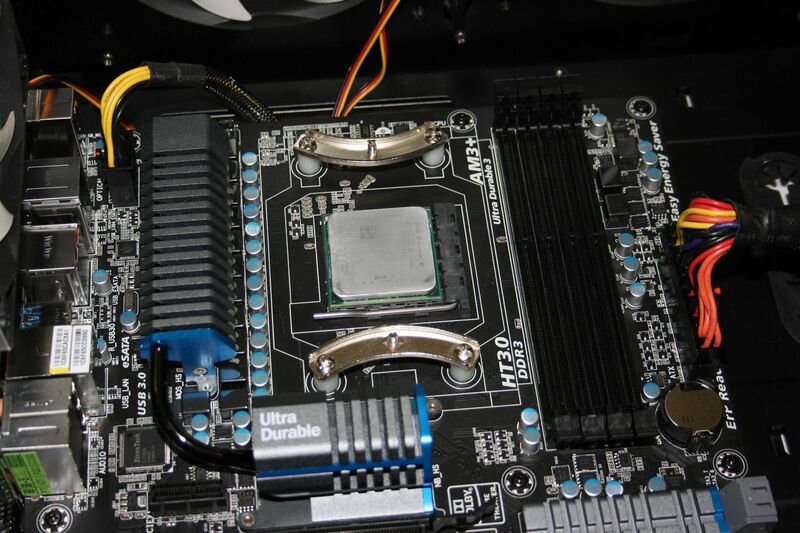 Once you have installed the RAM you can then mount the CPU cooler. 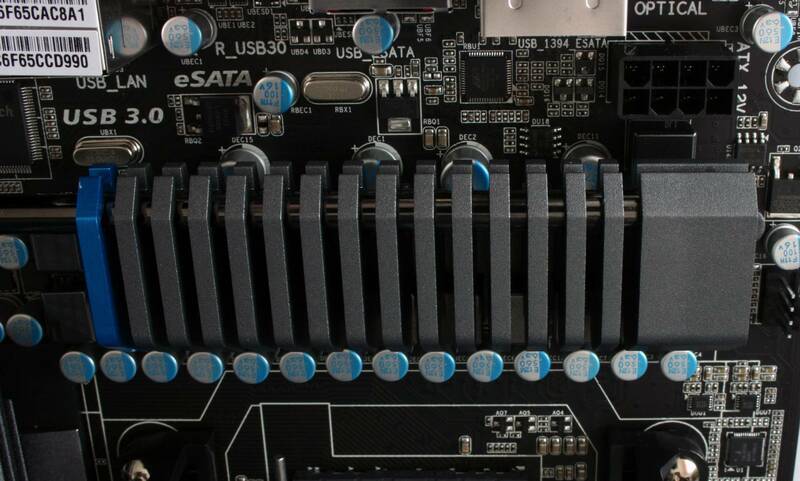 Before adding your Graphic Card(s) or other PCIE devices it is a good idea to mount your HDD and DVD drive(s) and attach the necessary SATA cables. This can prove very difficult if you try to do it after you have installed the Graphic Card(s) as the longer ones cover the SATA ports. 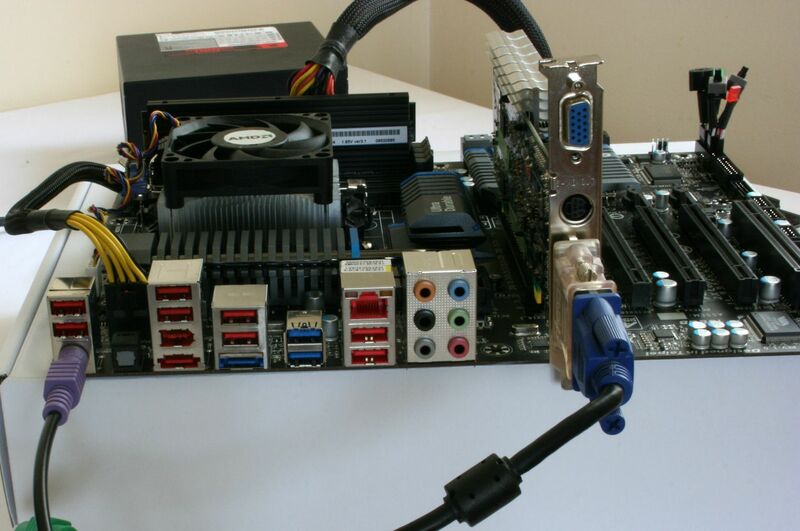 Now insert the graphic card and any other PCI(E) devices. It is now time to connect the remaining power leads. At this stage of the build I would advise you to only attach the power leads to the graphic card(s) if they need them, your main hard-drive and the main DVD/CD drive. If like me, you have more than one hard drive it is actually better to add them after you have installed the Operating System. Of course, if you are setting up a RAID array then you will obviously need to add the power leads to all the drives you are using. And that’s it; the PC is now built and ready to be fired up again. Hopefully everything will work fine and there won’t be any problems. 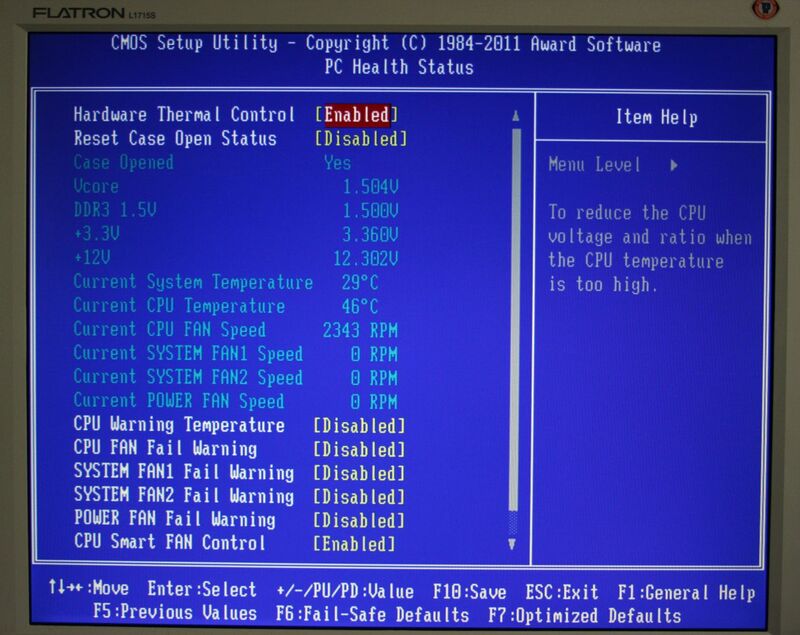 When you start the PC it is a good idea to go back into BIOS and make the adjustments that you want to . 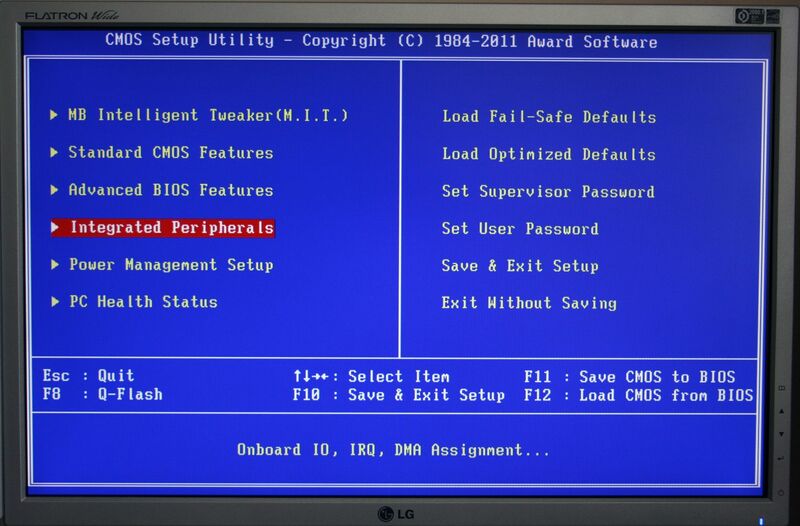 Once you have gone through the process of saving the changes to BIOS and rebooting you can then proceed with installing your Operating System. I’m not going to go through the steps of installing an OS here but I used a USB flashdrive to install Windows Ultimate 64 bit on this system. The process was quick and painless and in very short order I was able to login into Windows and check out Device Manager. This showed me that I was missing a few drivers. 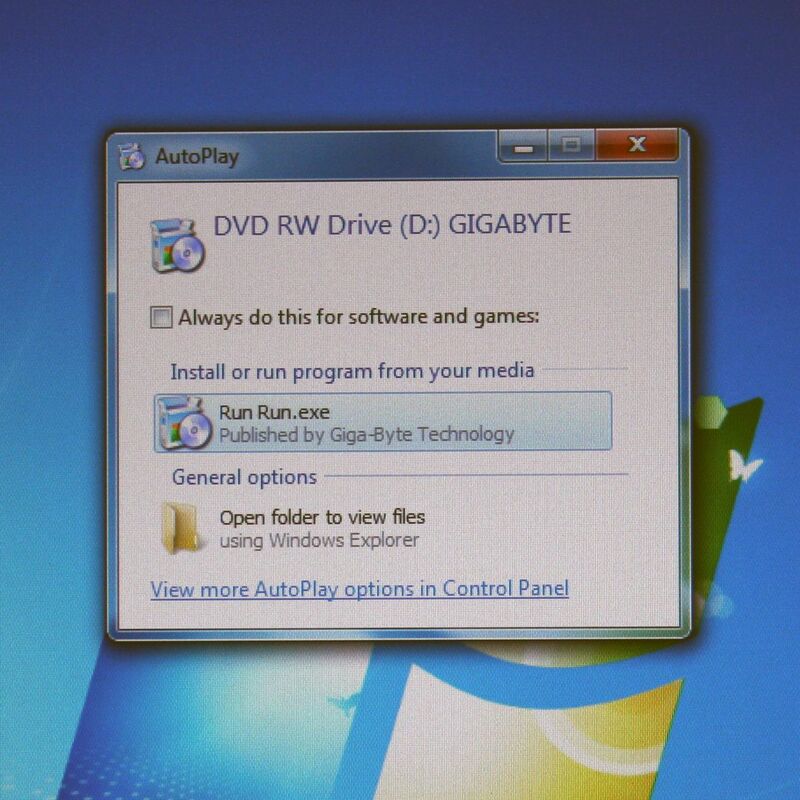 I decided to use the Gigabyte Install Disk and after loading it into the DVD drive the following window popped up. Clicking on the Run Run.exe brought up the following screen. 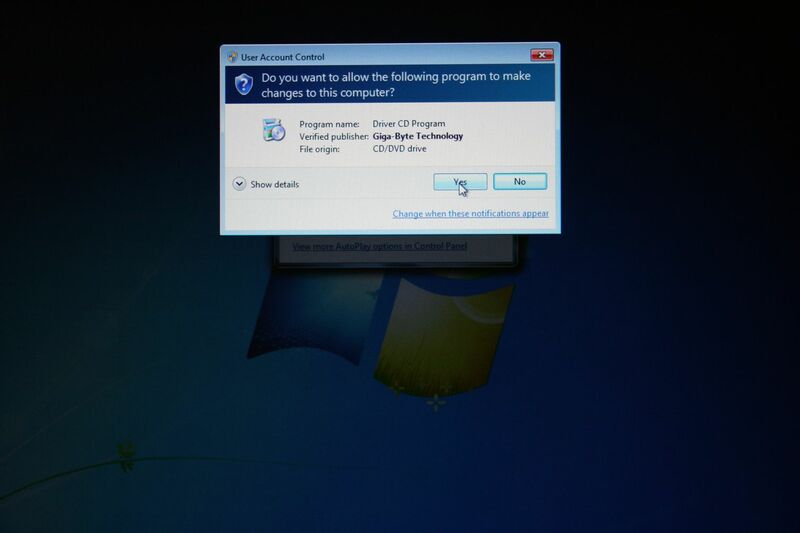 This is part of Microsoft’s User Account Control and after clicking yes the following screen appeared. 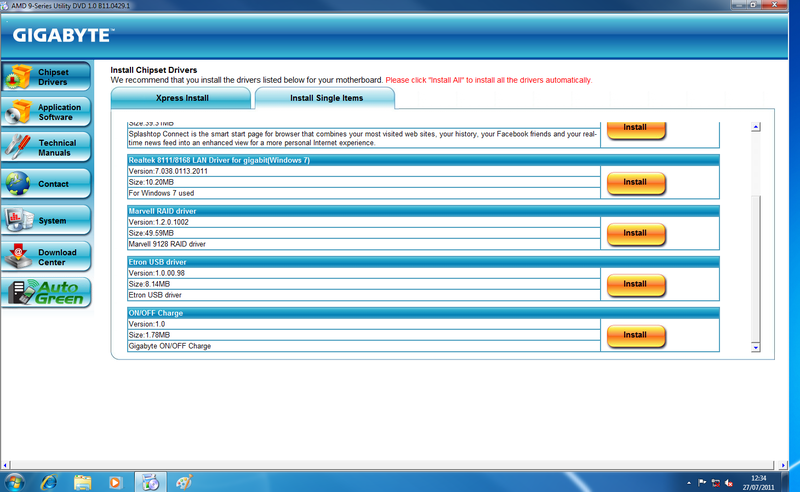 This allows you to install various items and as I only wanted to install the system drivers I unticked the other boxes and then clicked on the Install All button. 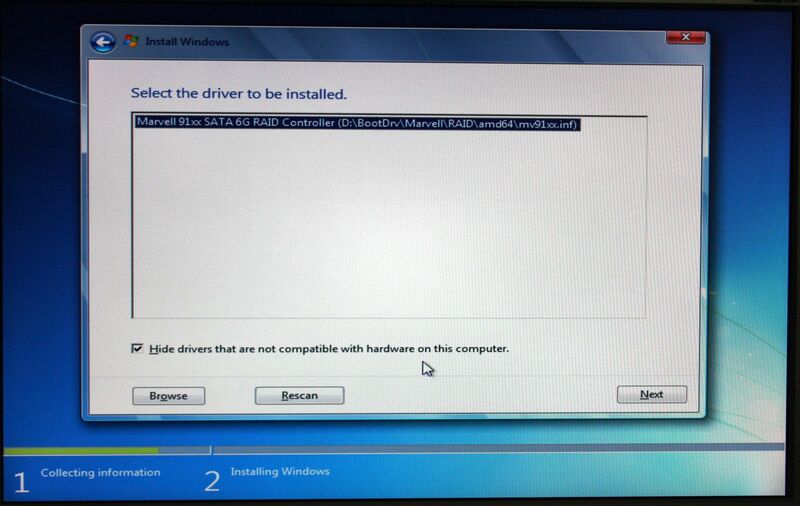 The drivers were installed without a problem. A quick reboot later and going back into Device Manager showed me that the drivers had been installed. The missing Multimedia Audio Controller shown in this image is for my M-Audio Delta1010 Soundcard and not a problem. 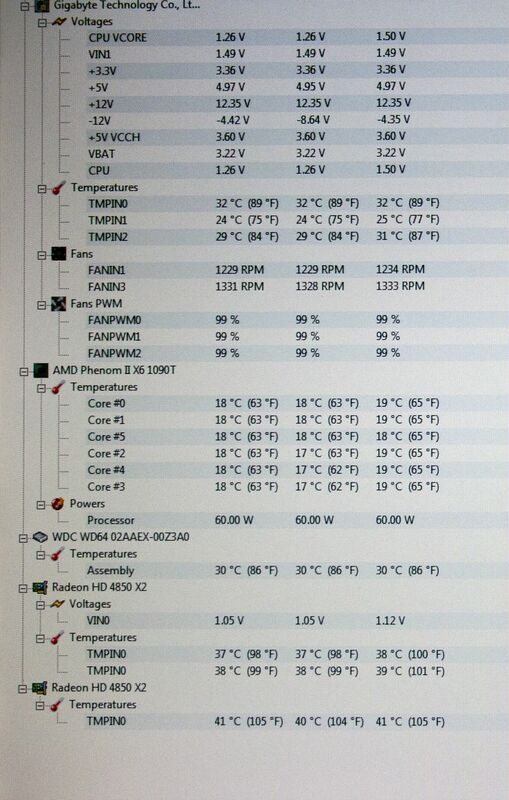 A quick check with HW Monitor showed me that everything seemed to be fine. 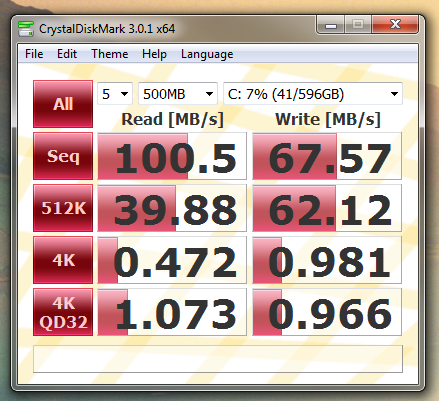 At this stage I ran a quick test with CrystalDisk Mark. 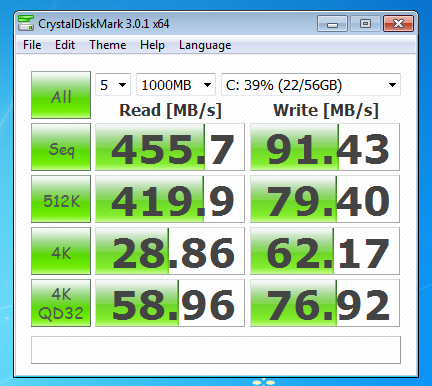 The Hard drive I am using is a Western Digital Caviar Black SATA 6Gb/s 640GB drive and this test was run using the AMD AHCI Drivers. I ran the test twice once using the 1000MB Read/Write test. Then using the 500MB Read/Write test. After running these tests I then re-installed the Operating System and drivers except this time I did not install the AMD AHCI drivers but retained the Microsoft ones installed by Windows and re-ran the CrystalDisk Mark tests. As you can see from these figures the Microsoft AHCI Drivers performed better than the AMD AHCI Drivers. 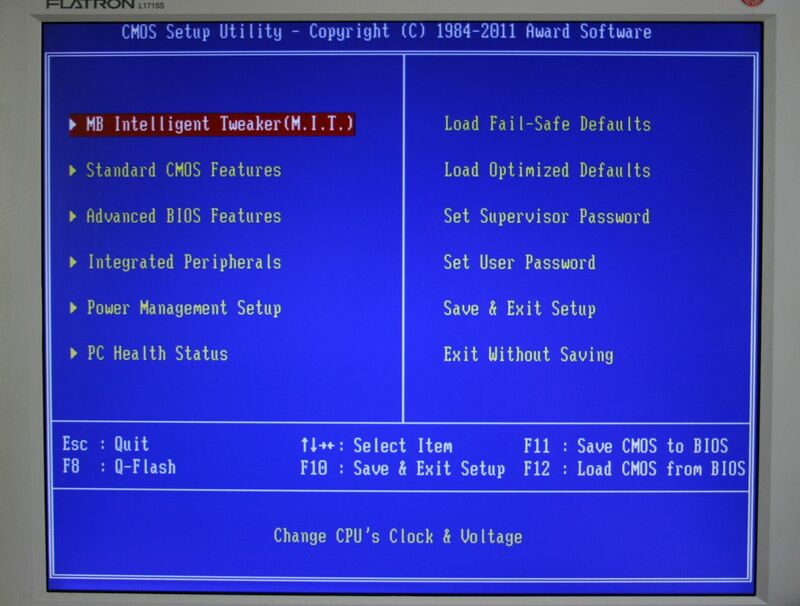 I then reinstalled the OS but this time I configured BIOS for Native IDE Mode. 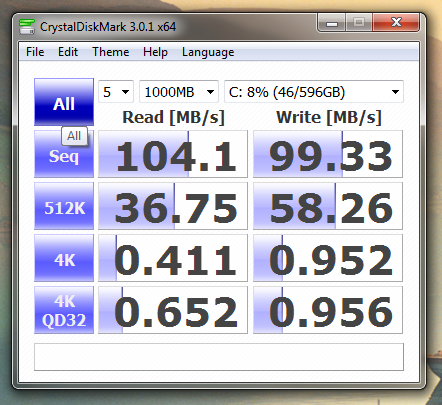 Once again I ran CrystalDisk Mark. As you can see with the SATA Controller set to Native IDE the Read/Write speeds are better than those in AHCI Mode when using the AMD AHCI Drivers. 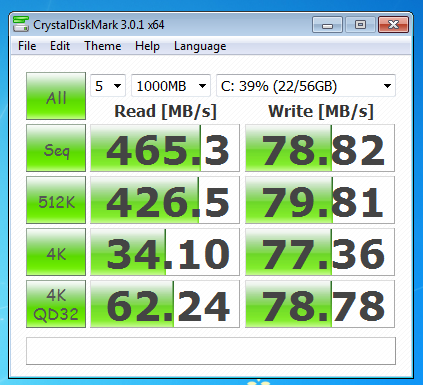 If you are looking to get the best out of a non- RAIDed HDD then AHCI Mode with Microsoft's standard AHCI driver is the way to go! 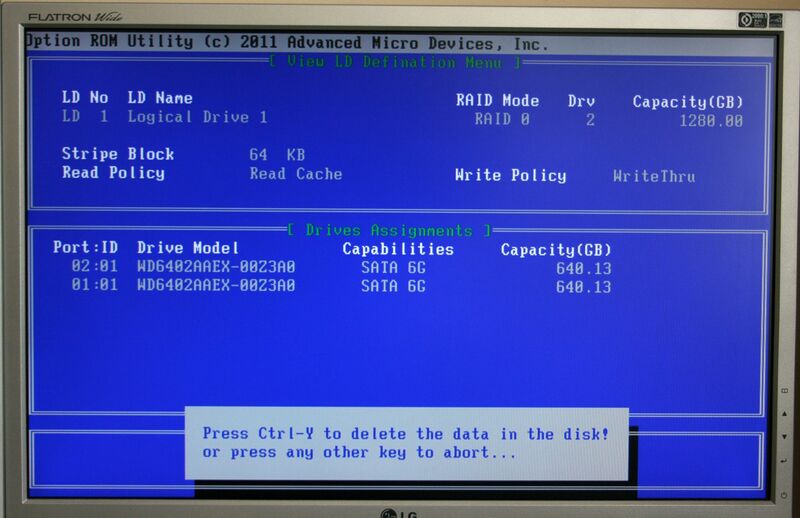 The first thing to do is make sure you have the correct hard-drives for your RAID array. These can be either mechanical or SSD but they should be of the same model and size to prevent any issues. 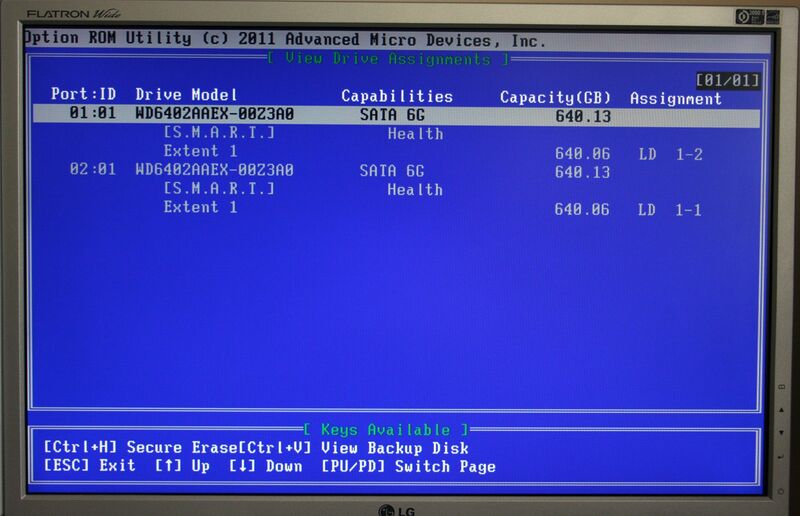 I am using two Western Digital Caviar Black SATA 6GB/s 640GB HDD’s for creating this array. 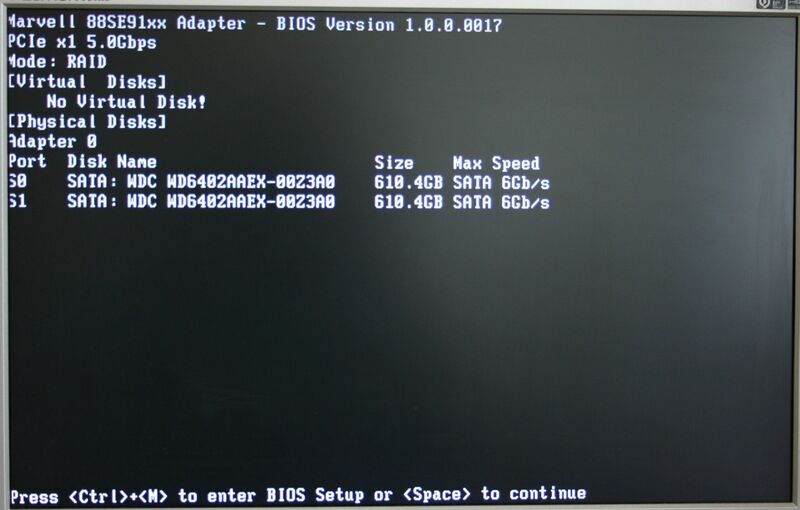 Set the OnChip SATA Controller to RAID from its default or current setting depending on whether or not you have made any previous changes to BIOS. This is particularly important if you wish to use a DVD/CD drive on one of these ports or if you are adding any extra drives that you do not wish to be part of the RAID array. 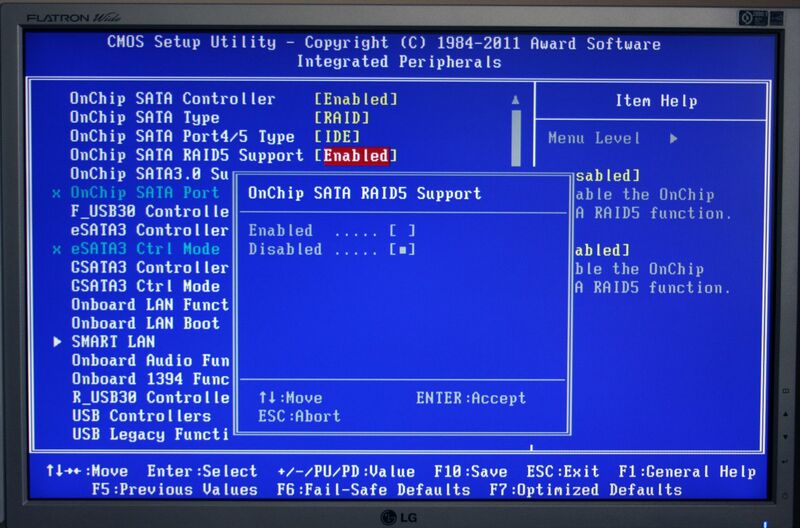 If you are not building a RAID5 Array you can safely disable the OnChip SATA RAID5 Support feature. 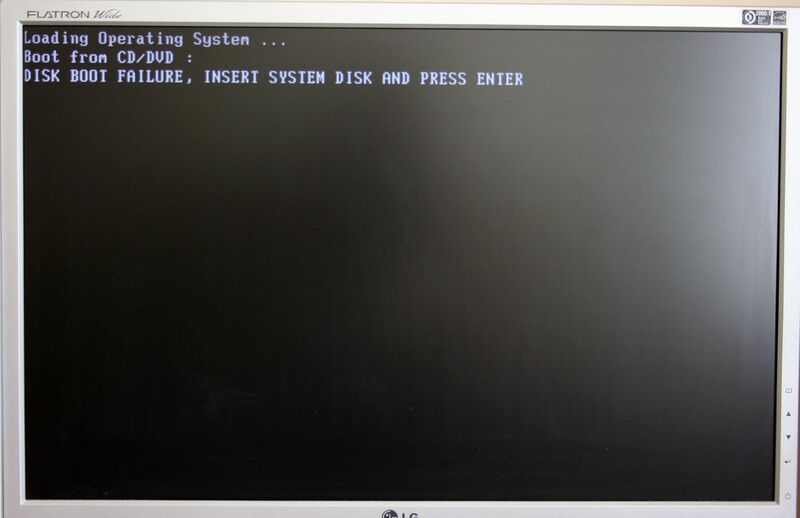 Press F10, once you have made your BIOS changes and press the enter key to restart the system. Once the system restarts you need to press the Ctrl+F keys to enter the RAID ROM Utility as this is where you actually setup the RAID Array. 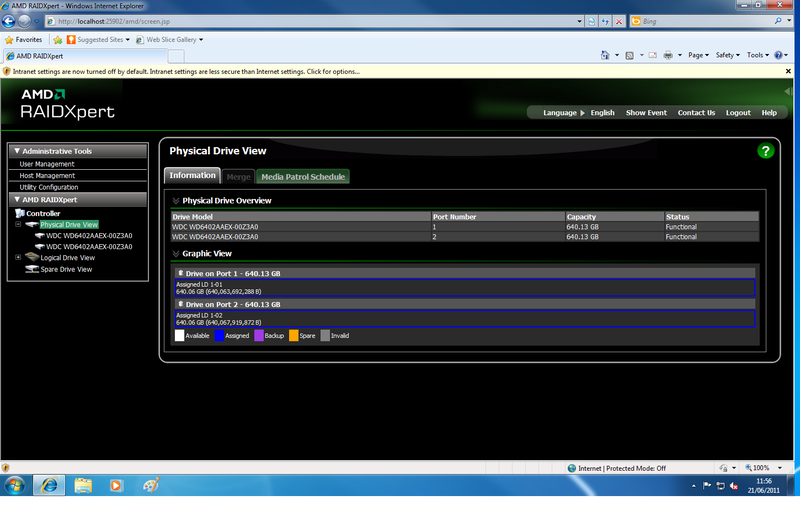 1 shows you the drives and how they have been automatically assigned. 2 brings up the LD View Menu. 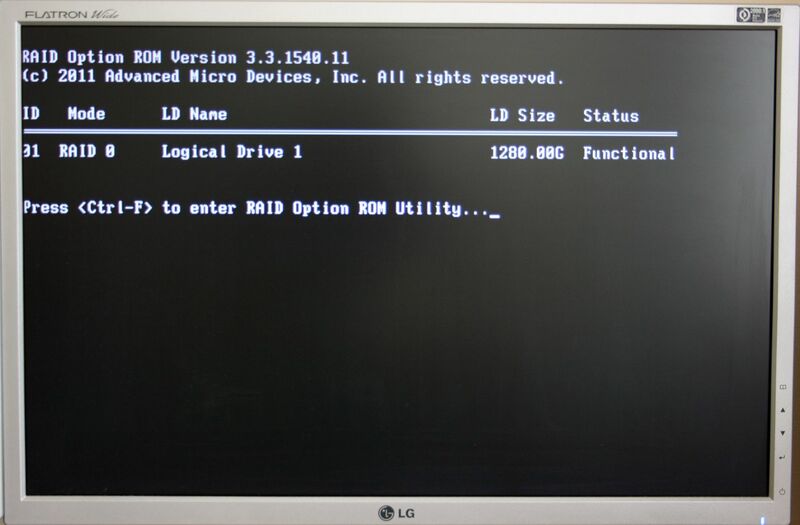 LD stands for Logical Drive and it shows that the Raid Mode is 0 and that there are 2 drives in the Array. 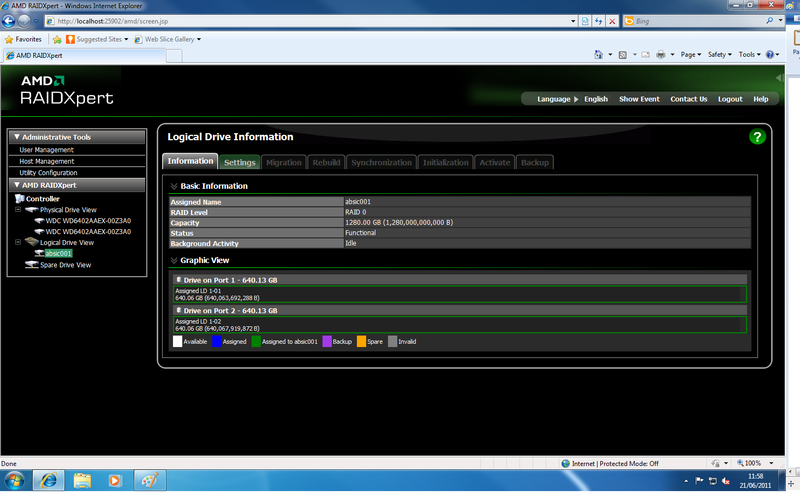 It also shows the Total capacity of the drives and that the array is functional. I have to say that, at this stage, I was a little bit puzzled as the Array had been automatically setup which I really hadn’t expected. Pressing Del+Ctrl+D allows you to delete the Array and you are asked to confirm the delete process by pressing Ctrl+Y. You don’t need to do this but I decided to do so as I wanted to see the steps for building an Array. When you delete the array you are confronted by this screen. 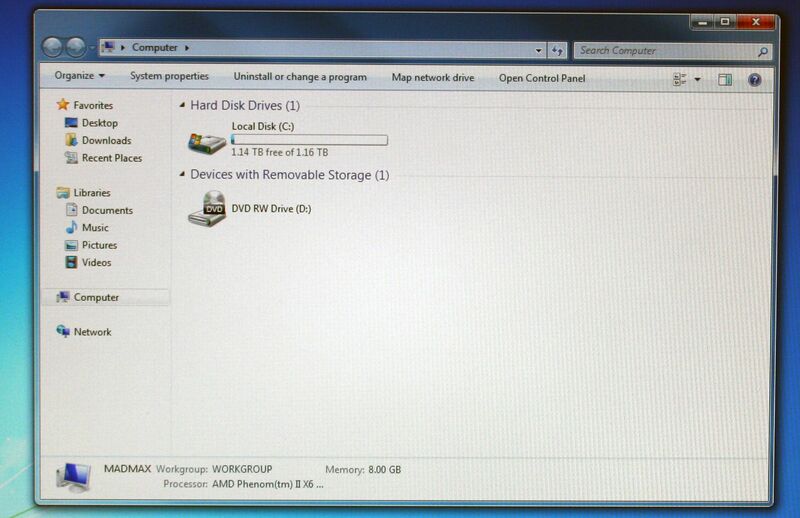 Pressing Ctrl+ C brings up the screen that shows the attached drives. You need to use the up and down arrows to navigate the page and when you highlight one of the drives, pressing the space bar switches it from inactivate to active. 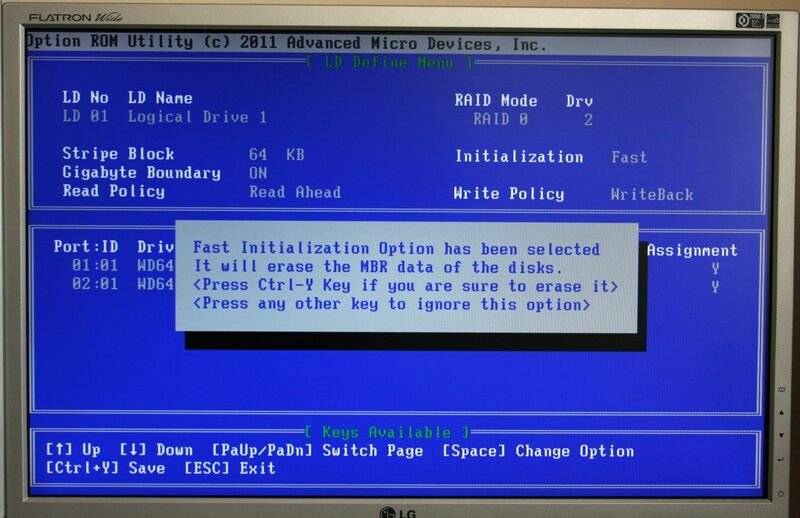 Obviously you need to make sure the drives you intend to use are active then press Ctrl+Y to Save. A popup will ask you to press Ctrl+Y again if you wish to give the Logical Drive a name. If you want the default name just hit any key at this stage. I hit the Ctrl+Y and then assigned the Logical Drive with a name I could easily recognise. Pressing Ctrl+Y again brought up the following screen. I pressed Ctrl+Y again and the Array was created. 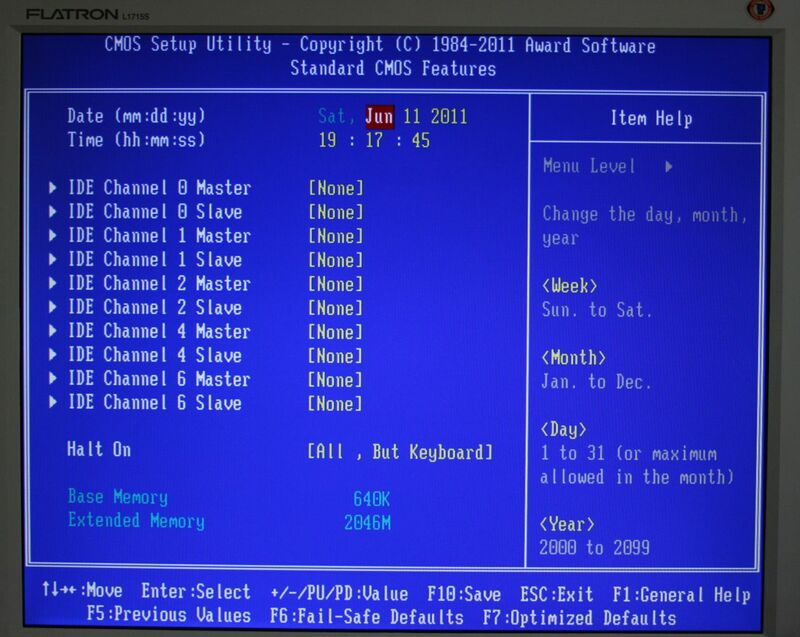 I was then given the choice of modifying the Arrays capacity or leaving it at maximum. I left it at maximum. 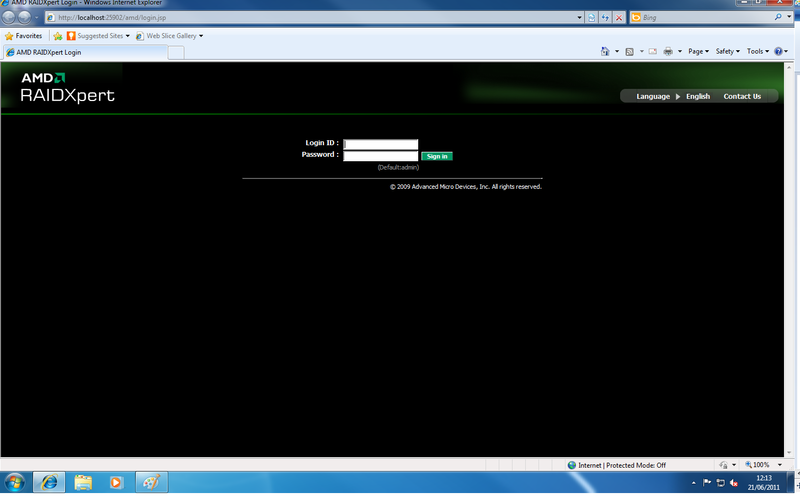 I was the informed that the system would Reboot and asked to confirm this was OK by pressing the Y key, which I did. If, at this stage, you are not sure of the settings you can press any other key and go back. 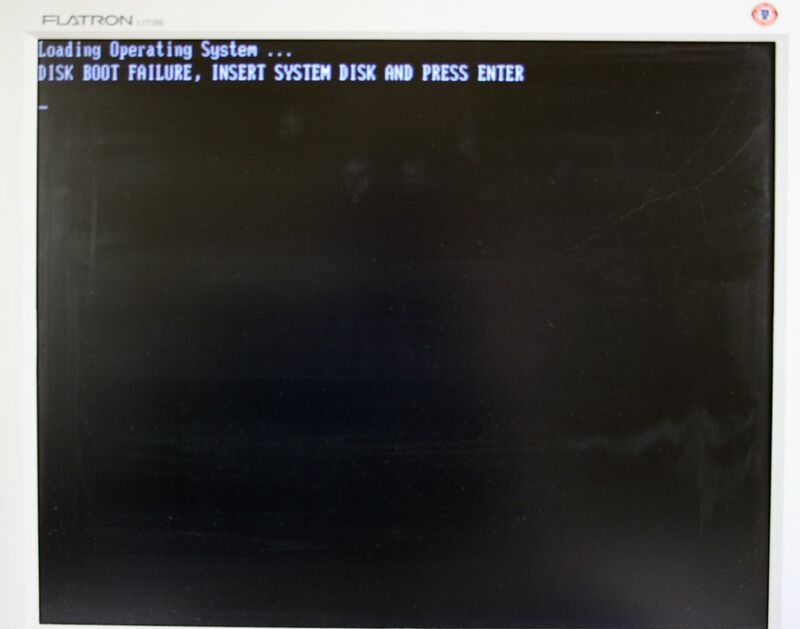 The system rebooted and the familiar Disk Boot Failure screen came up, which is not surprising as there is no OS installed yet. I switched off the PC, plugged in my USB Pendrive that install the OS from and rebooted. Pressing F12 gave me the BOOT Menu dialogue where I highlighted the USB-HDD option, hit enter and proceeded to Install Windows 7. Again, I have to admit to being a little concerned here. I had prepared the AMD RAID drivers on another USB Pendrive as I believed they would be needed but no, Windows recognised the Array and the install proceeded without the need for adding extra drivers. 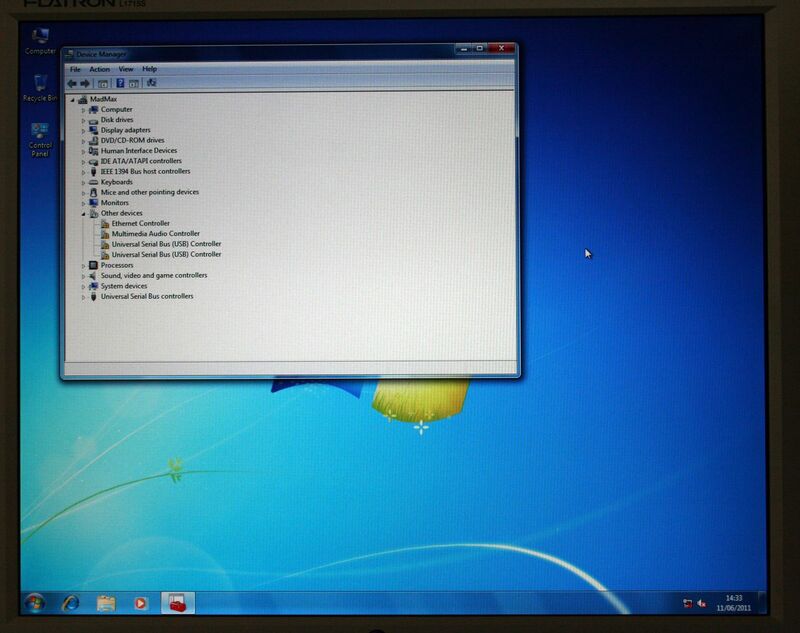 Once Windows7 had installed a quick check showed that everything was indeed working as it should. 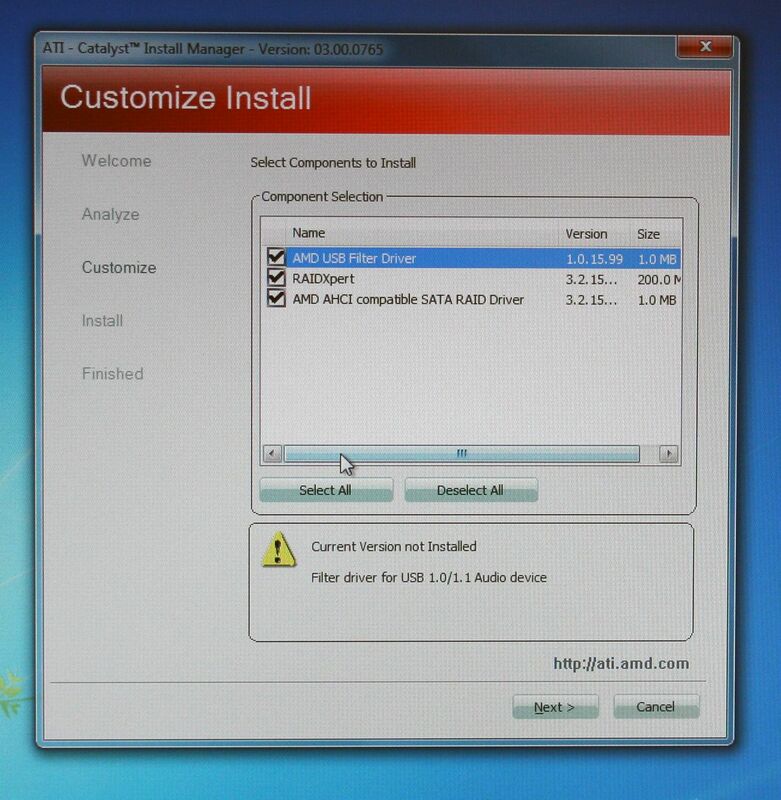 As you can see from this image AMD AHCI Compatible RAID Control drivers had been installed along with Windows 7. I then installed the ATI motherboard drivers which added the AMD RAIDXpert function along with the AMD USB Filter Driver and the correct AMD AHCI Compatible SATA Raid Driver to replace the ones installed by Windows. 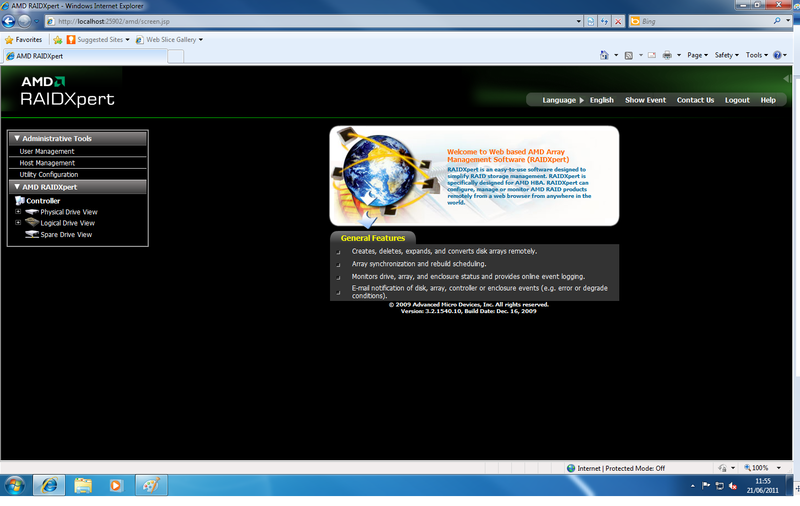 AMD RAIDXpert is a browser based utility and when you first run it you are faced with this screen. 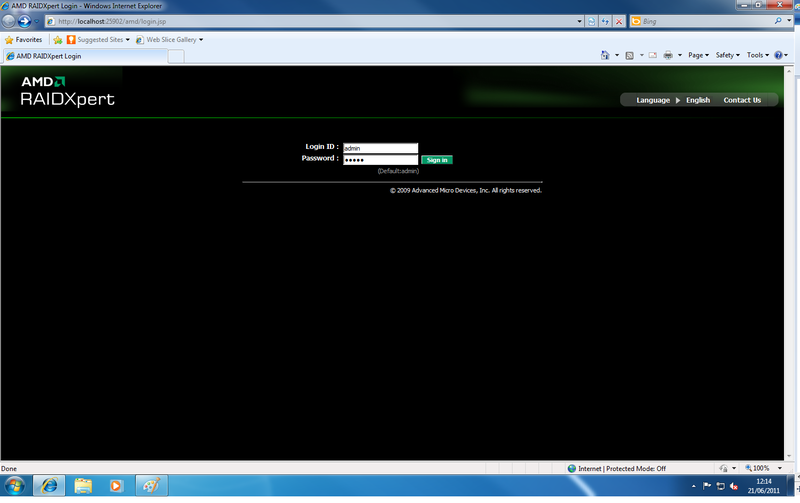 To actually do anything you need to login and no indication of the Login ID or Password is immediately given. However, the default for both is “admin” and it does show this in brackets underneath the boxes…… Doh! A real Homer Simpson moment there if you don’t know what to do. The home screen is pretty basic with the User Options on the left hand side of the screen. I’m not going into details of RAIDXpert but here are a couple of screenshots so you know what to expect. 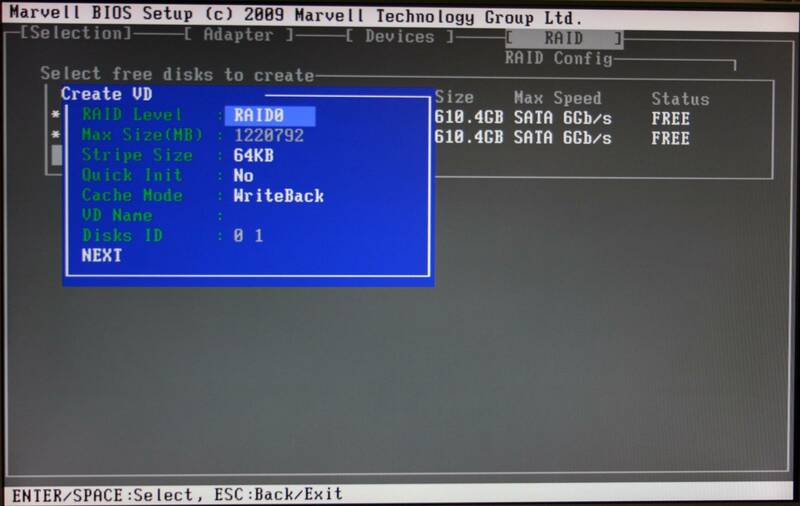 Once I had installed the drivers and was happy everything was running as it should I then ran CrystalDisk Mark to get an insight into the read/write capabilities of the RAID0 array. As you can see they are about double of a single SATA HDD in either AHCI or Native IDE mode. If you like to use hardware monitoring programmes to keep an eye on temperatures you will encounter a problem as the HDD’s in the RAID Array do not show up in the usual monitoring programmes. a: The HDD’s I used were recognised and automatically configured correctly and needed no intervention on my part and…..
b: I didn’t need to install any specific RAID drivers, using F6, during the Windows7 installation. However, I did encounter one small issue, which I believe to be down to the BIOS and I hope it is addressed with a future update and that is, the system would hang at the “Press <Ctrl-F> to enter RAID Option ROM Utility….” screen when rebooting. 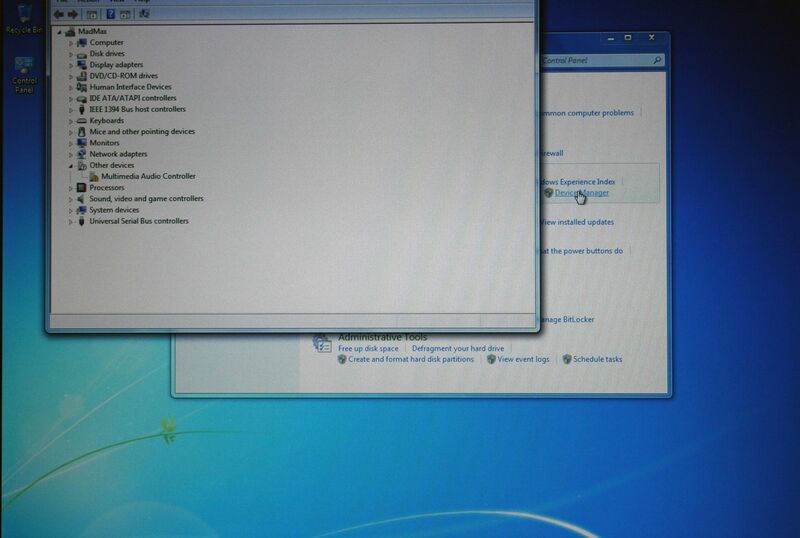 To overcome this I had to shutdown the PC completely and then restart to progress further. The RAID Array functioned at the speeds I was expecting, using mechanical hard-drives and I really can’t fault it in this mode. It is very easy to set-up and once installed works as you would expect. 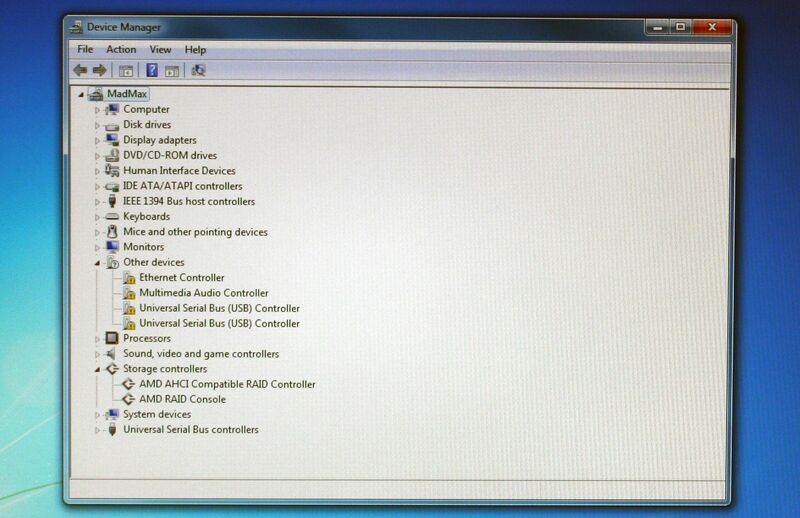 AMD RAIDXpert allows you to control and check the array and seems to contain all of the functionality that you would need. Overall I was very impressed and, not being a regular RAID user I was pleasantly surprised at how much easier it is becoming to set-up and to use a simple RAID array. 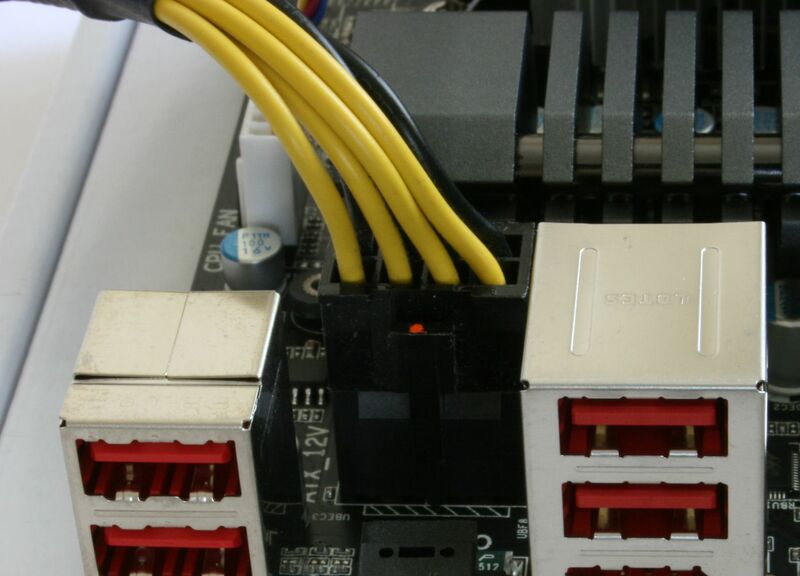 Having been running the board for several weeks with my hard drives attached to the AMD SATA Controller so I thought it was about time to investigate how the Marvell SATA Controller works on this motherboard. I have to say that I was reluctant to test it as my previous experience with the Marvell 9128 SATA Controller on the GA-790XTA-UD4 motherboard was less than positive. I shouldn’t have been worried though as after reconfiguring my system and setting up the Marvell SATA Controller in AHCI mode I was able to install Windows7 without any problems. Reading through the User’s manual it says to install the Marvell AHCI/RAID controller during the install of Windows7 using F6 but I ignored this advice and let the operating system install using just the native Microsoft AHCI drivers. 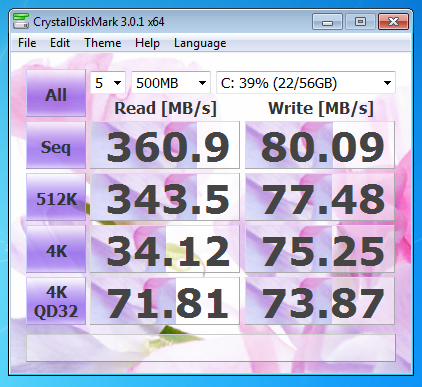 For these tests I am using a single Western Digital Caviar Black 640GB SATA3 6G/Bs hard drive, which is the same drive I used when testing the AMD SATA Controller. 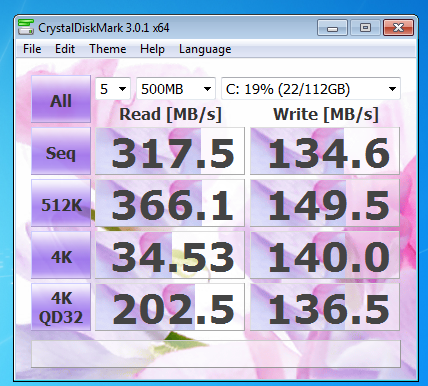 Once I had the system up and running I ran CrystalDisk mark with the Microsoft AHCI drivers, to get an idea of the read/write speeds of the controller. As you can see from the following images the read write speeds are slightly slower than those of the AMD SATA Controller using the same driver. 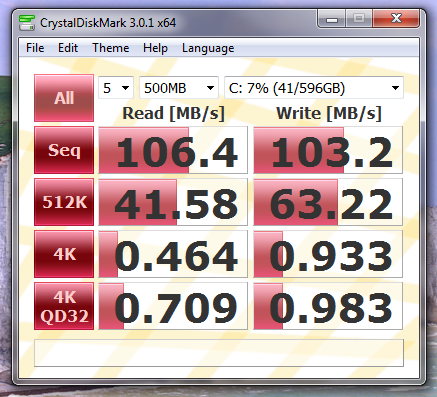 I then installed the Marvell AHCI Drivers and re-ran the same tests. As you can see, the returned figures what somewhat different with the read speed during the 1000MB test being 13MB slower whilst the write speed was actually slightly higher. Because of the variation in figures I re-ran this test five times and the figures that were returned stayed around these numbers. 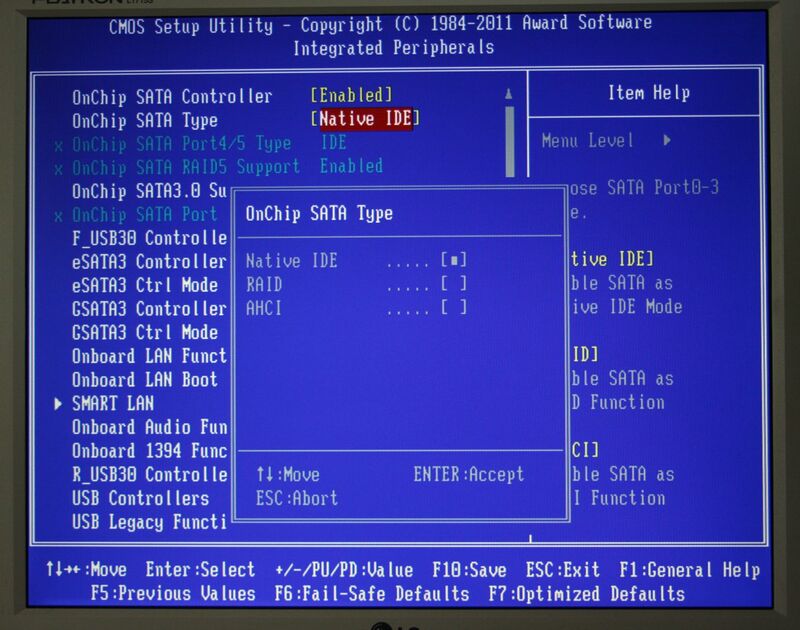 I then reconfigured the BIOS settings for the Marvell SATA Controller to Native IDE Mode, reinstalled the Operating System and then ran CrystalDisk Mark again. The figures that came back gave me a bit of a shock as I had been expecting lower numbers but, as you can see from the following images, the read/write speeds are actually better in IDE Mode than in AHCI Mode. This controller has me a little confused and I’m not exactly sure of the best way to configure it, performance wise, if you are just running one or two stand alone hard drives. 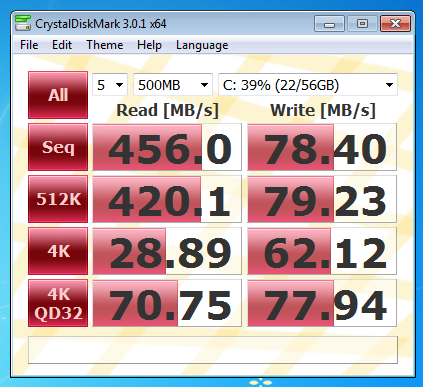 Overall, the Native IDE mode returns the best read/write figures but if you are running an SSD (which I do not have for testing purposes) you will be looking to run in AHCI Mode and this may give a slight performance hit. 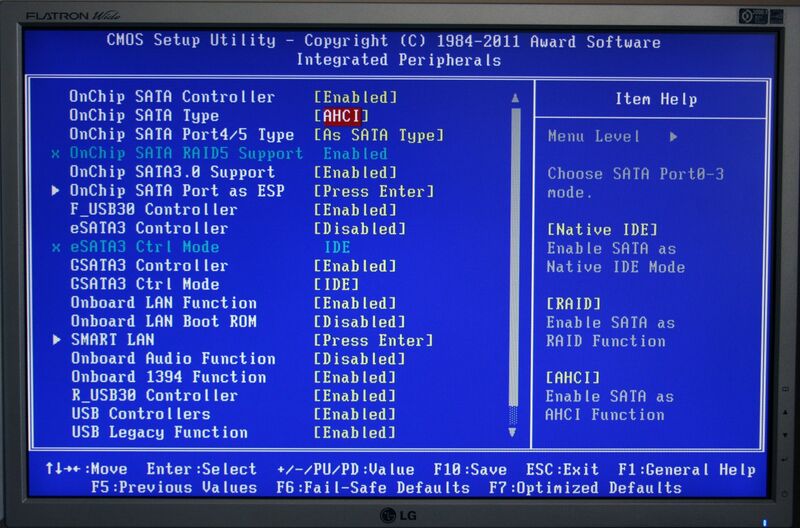 As things stand, personally I will be leaving my DVD/CD Writer attached to this controller in IDE Mode and returning my HDD’s to their usually position on the AMD SATA controller as I believe that this offers the best performance options when running non-raided HDD’s. But how does this controller perform when in RAID mode? That is something I am going to be exploring over the next couple of days….. 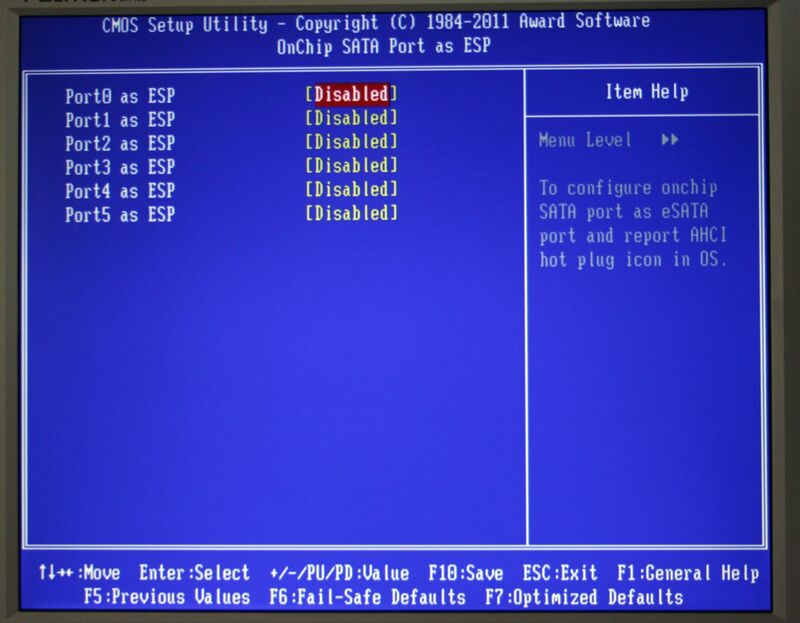 Setting up a RAID0 Array on the Marvell 88SE9172 SATA Controller. 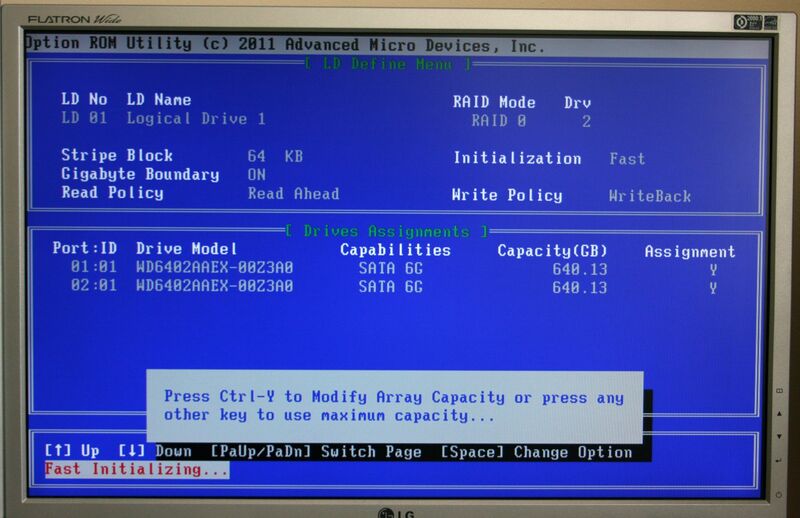 With two Western Digital Caviar Black 640GB SATA3 6G/Bs hard drives in hand, I decided it was time to see how this controller operates in a RAID0 Array. 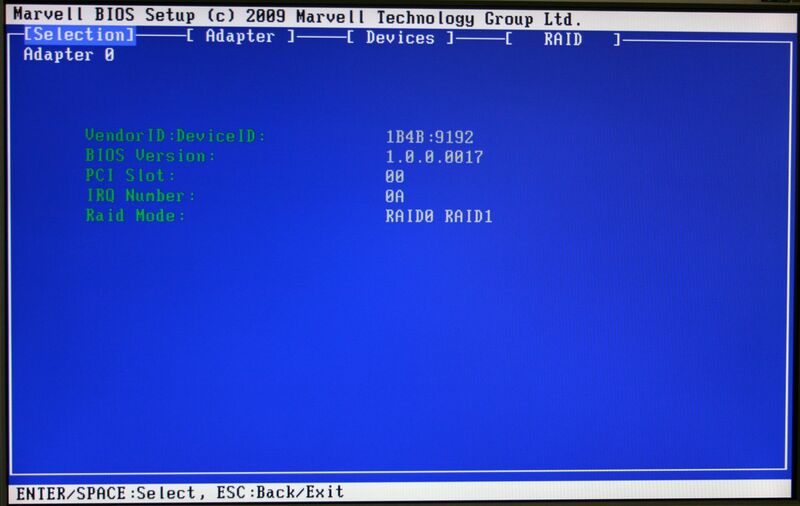 The only previous experience I have had with running a RAID Array on a Marvell Controller (the 9127 chipset on the GA-790XTA-UD4) was, shall I say, less than perfect. In fact, with exactly the same hard drives, I couldn’t get that controller to work in anything other than Native IDE Mode! 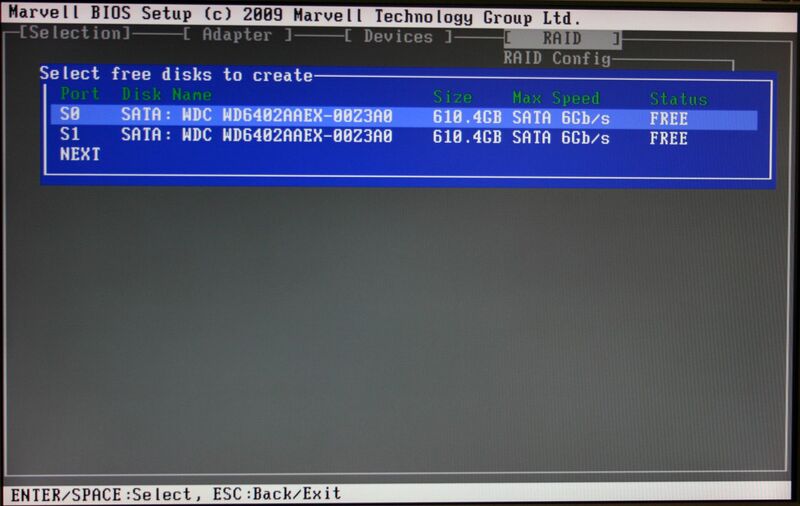 Ever the optimist and with my favourite saying: “Never give up; Never surrender!” running through my head, I attached the drives to the Grey Marvell SATA ports and I then started the PC and entered BIOS to make the necessary changes. 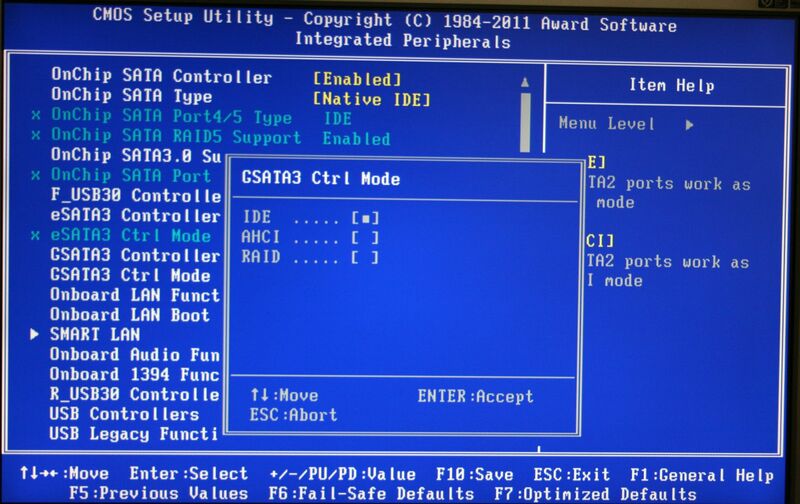 I should point out at this stage the all of the following BIOS screenshots are from the F5b BETA BIOS that I am running and that the options may be different if you are running a different BIOS version. 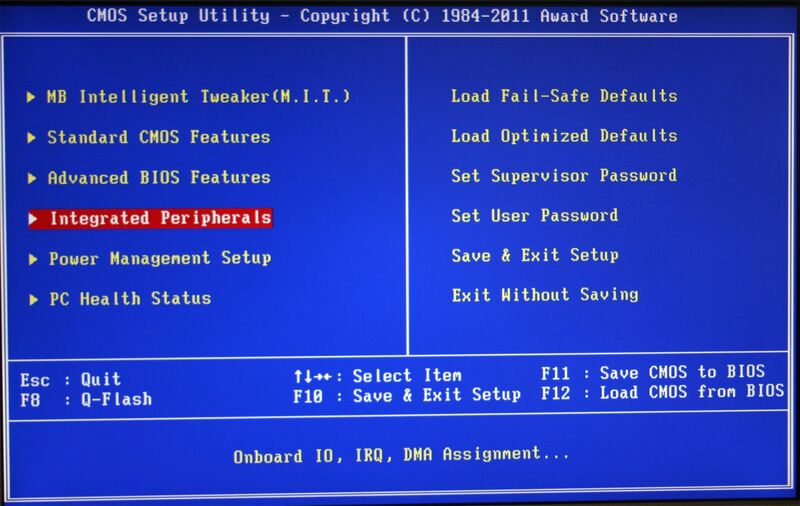 Upon entering BIOS the first thing to do is to navigate to the Integrated Peripheral page. 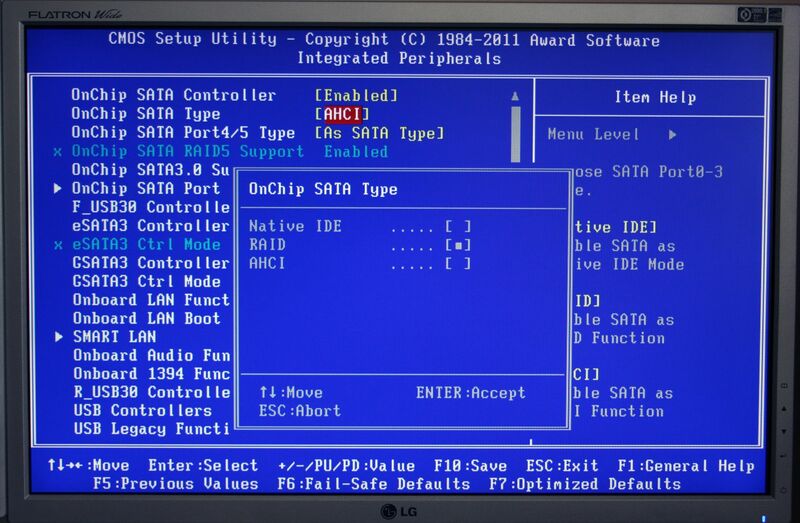 The OnChip SATA Controller at the top is for the AMD SATA Controller and as I had attached my DVD/CD Drive to one of these ports I set the controller to Native IDE. 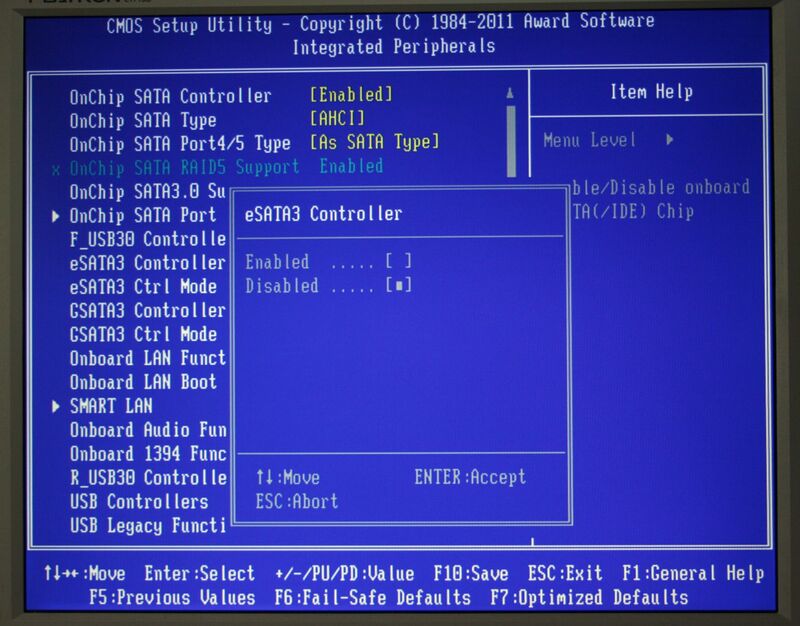 The GSATA3 Controller is the one for the Marvell 98SE1972 Chipset that controls the On-board SATA connectors so I double checked that I had enabled this. 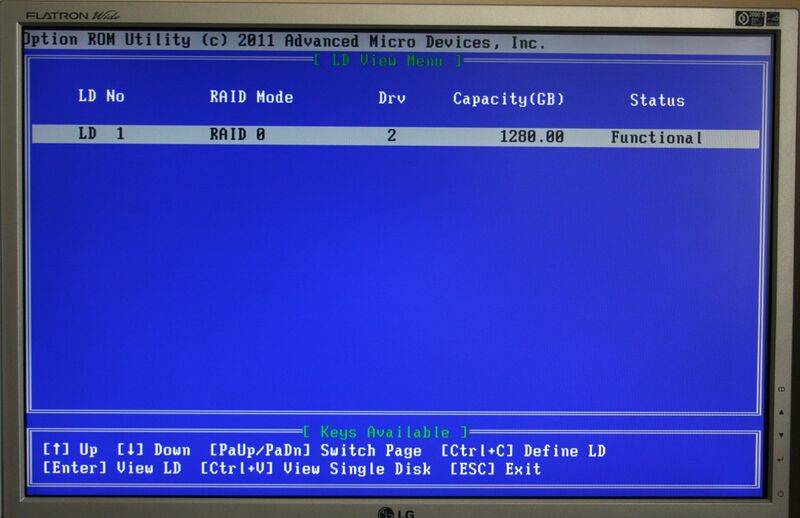 The next thing to change is the GSATA3 Ctrl Mode from IDE to RAID. 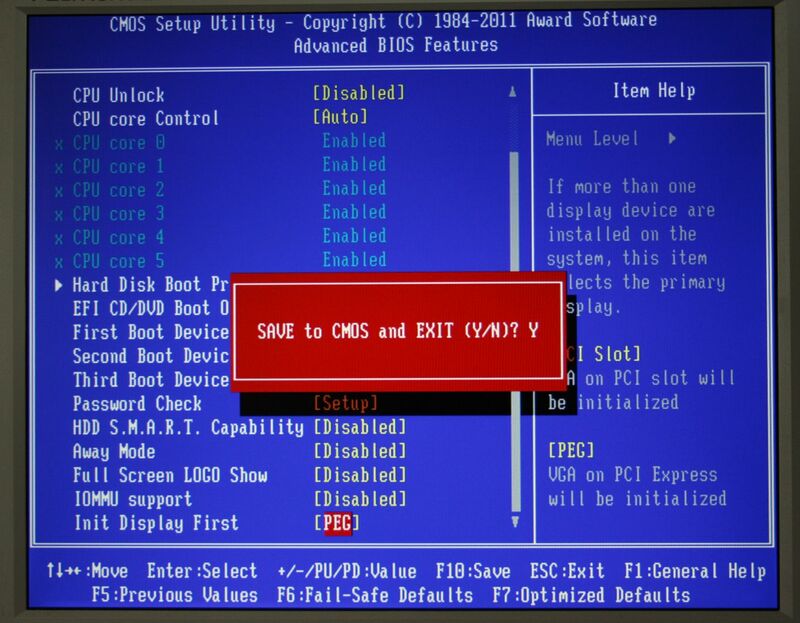 Hit the F10 key to save to BIOS and then reboot. 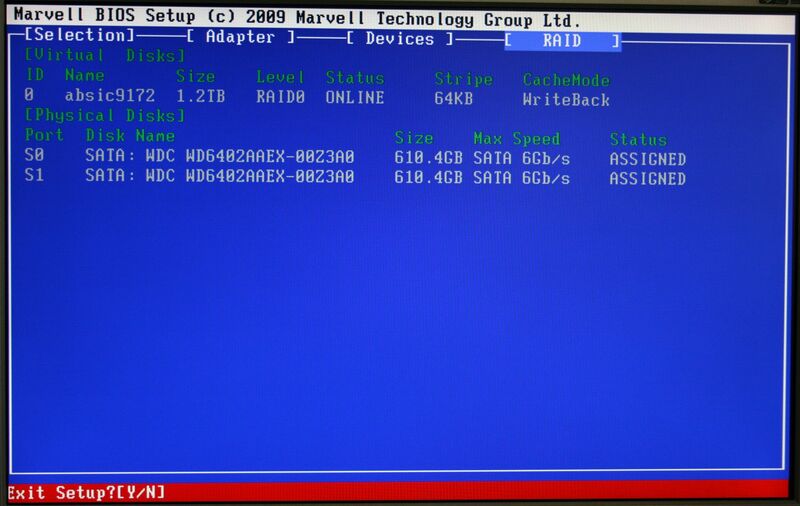 When the PC rebooted it went through the usual POST Checks and the Marvell Controller for the RAID appeared. 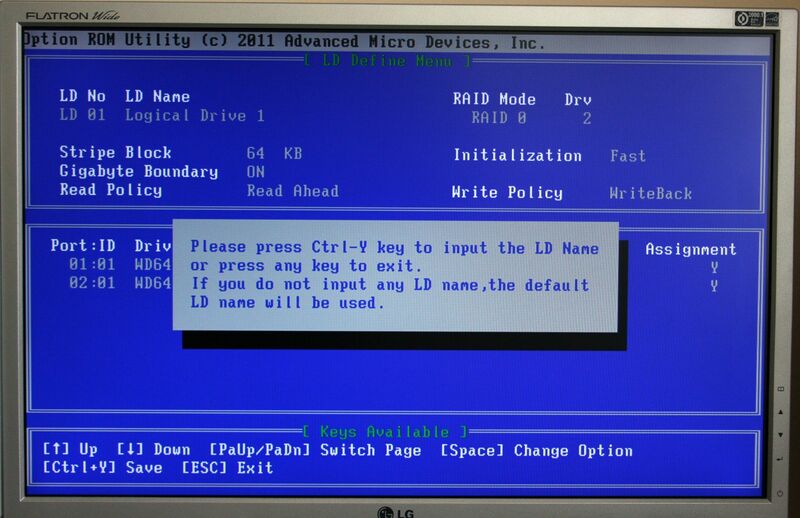 At this stage you need to press the Ctrl+M keys so that you can assign the hard drives to the RAID Array. 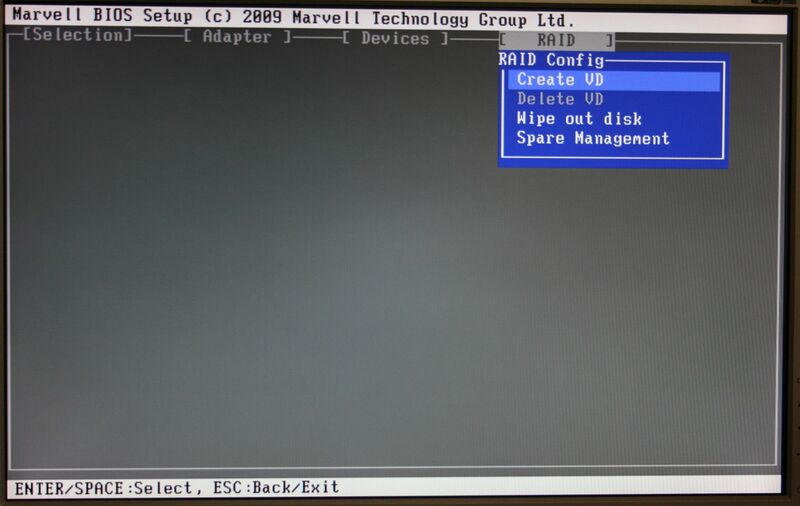 Entering the Marvell BIOS Setup utility you are faced with this screen. Navigation is made by using the “arrow” keys on the keyboard to highlight an item and the Enter (return) Key or the Space Bar to select it. A quick run through the different headings brought up the following screens. 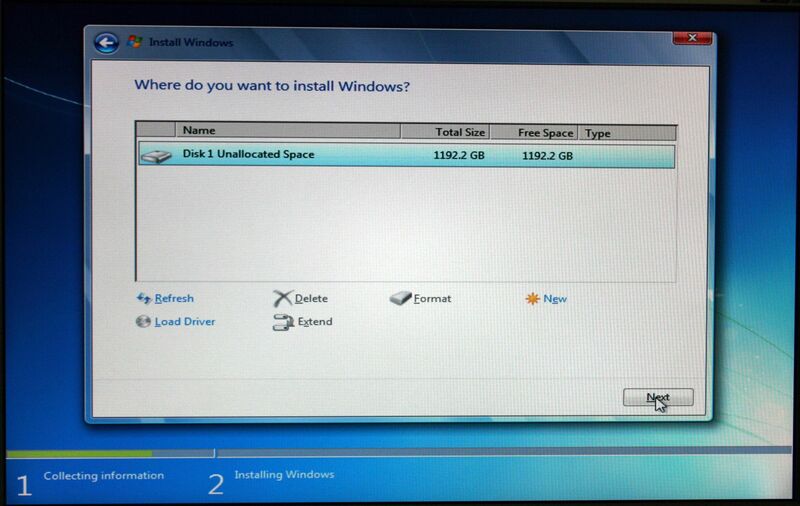 This screen shows the hard drives and also your virtual disk if you have created one. 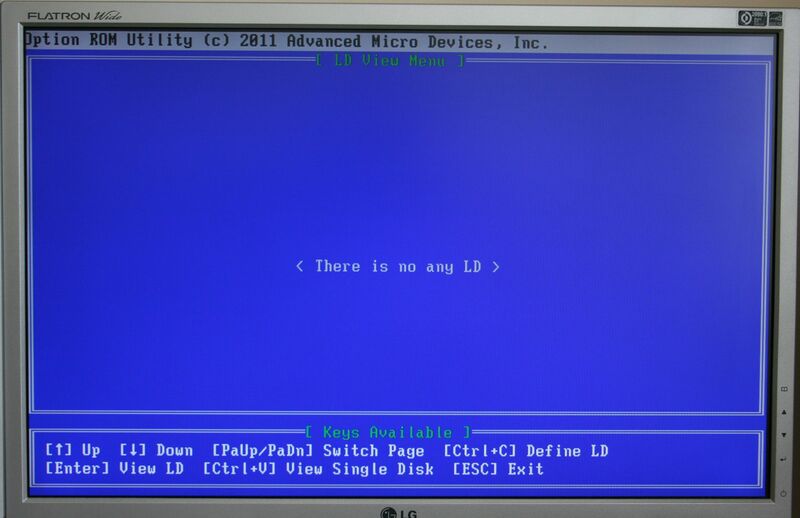 In this instance it is saying No Virtual Disk! This was not a surprise as I hadn’t created one yet. Entering the RAID heading gave me this screen. 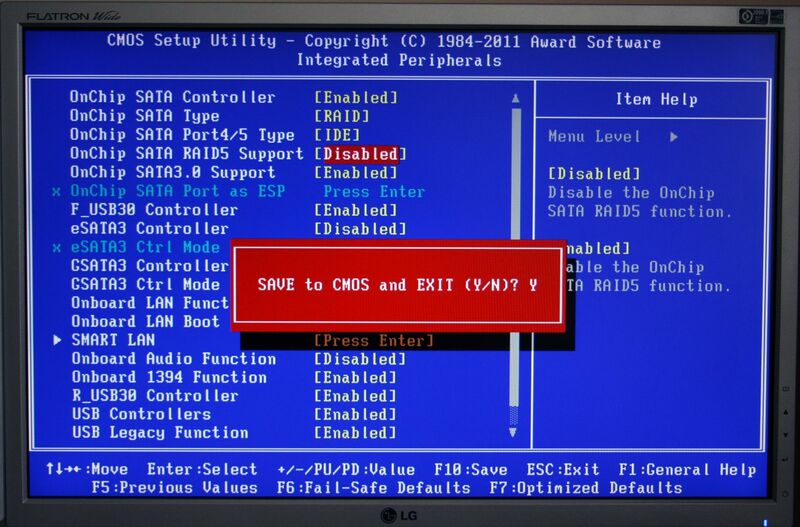 As I wanted to create a Virtual Disk I highlighted that option (Create VD – VD stands for Virtual Disk) and pressed the enter key, which gave me the following screen. 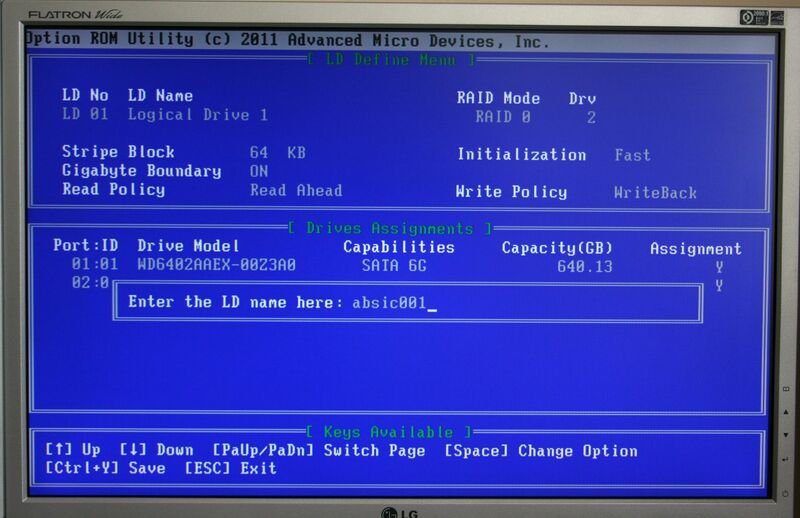 This was very similar to the Devices screen but here you actually select the drives for the RAID Array. To do that you highlight the drive and then press the enter key or space bar. When you do this a small asterisk appears at the start of the line. You need to do this for both drives. Then highlight the Next and press enter which brings up this screen. Here is where you choose your RAID Type and the choices are RAID0 or RAID1. I selected RAID0 and left all of the other parameters at their default settings…..
except for the VD Name which will help identify the Array if you have more than one array. Once again you need to highlight the next line and press enter. I hit the Y key and after a couple of seconds the following screen appeared that showed me that the RAID Array had been created and that it was online. Once I was happy that everything was fine I pressed the “Esc” Key and I was asked if I wanted to Exit Setup. I pressed the Y key and the system rebooted and everything was working as I thought it should. 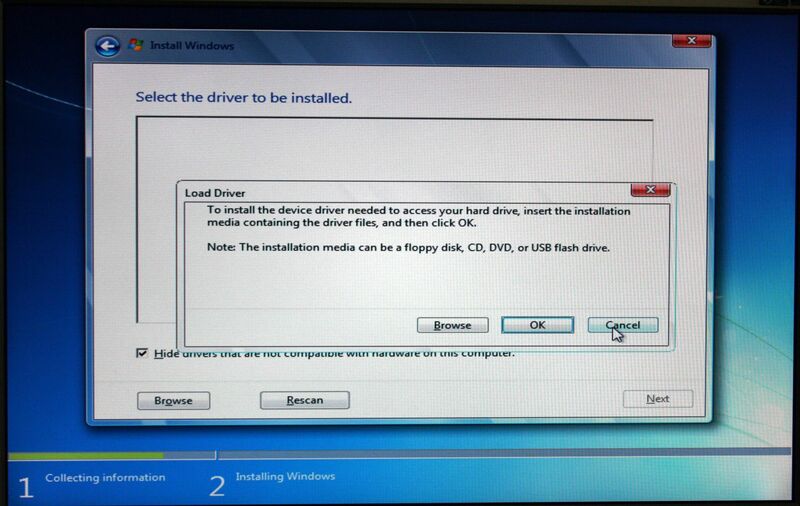 I then proceeded to install Windows 7 and after going through the initial stages I was asked for the device driver. You then need to highlight the folder named AMD64 and click on the OK button. 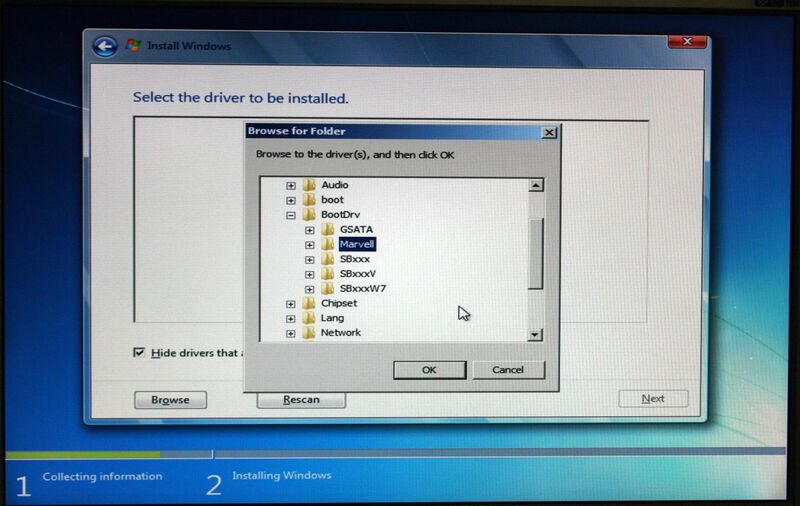 Windows will show you the selected driver and then you can click the “next” button to proceed with the installation of Windows. 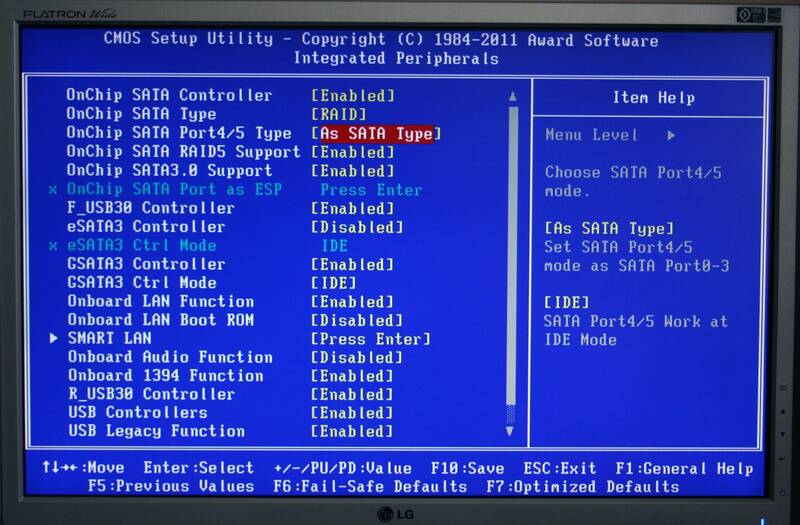 The RAID Array is now visible and installing the OS is the same as for installing in IDE or AHCI mode. Once into Windows I noticed that the RAID Array had become a removable device, but I wouldn’t advise you to try clicking the eject option! Breaking with my normal tradition of never using the Installation DVD to load drivers I launched the installation software. 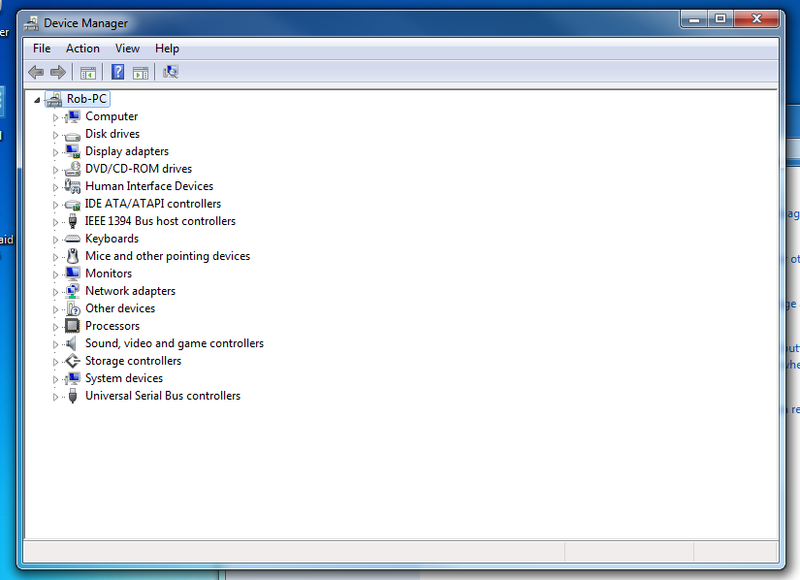 I checked through the items that it wanted to load and then proceeded to install the drivers as single items. 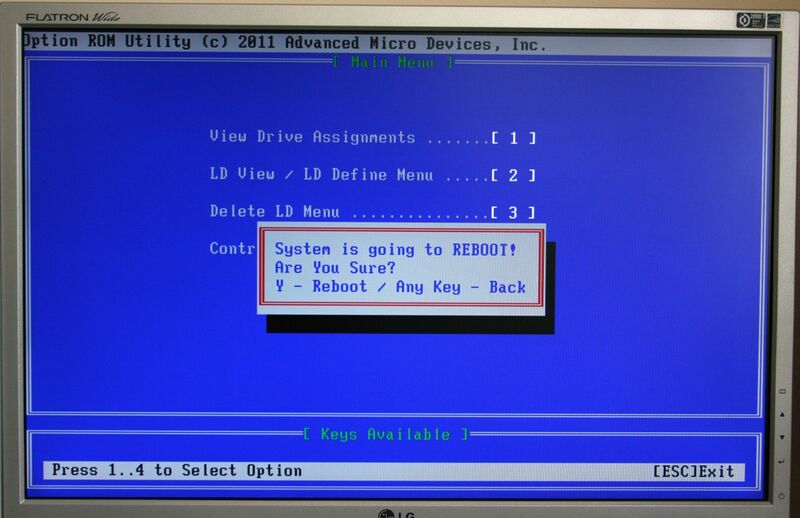 Once the installation had been completed I was asked to reboot the machine. I did this but was surprised when, after the PC had restarted, I was informed that it had loaded the required drivers and would need to reboot again. I did another reboot and everything seemed fine. Everything was fine though I should point out at this stage, that I was never asked to install drivers for any of the AMD features on the motherboard and the Installation Disk did not have any specific AMD drivers showing either. 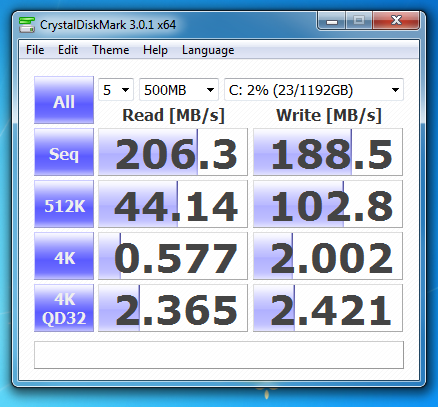 I then ran CrystalDiskMark to see what read/write speeds the RAID Array was returning. When I started this part of the review, I have to say that I did so with more than a little apprehension. 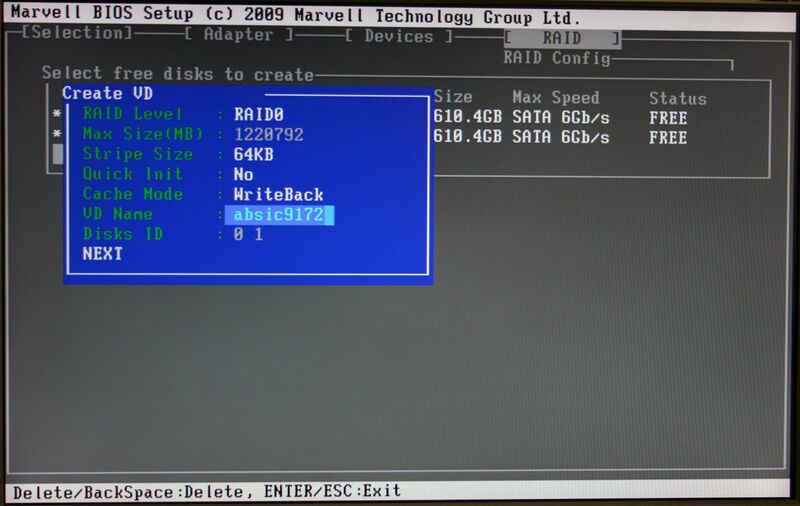 The same make of hard drives on the Marvell 9127 chipset had been unable to function and, at that time (approx 12 months ago) even Western Digital claimed that I was trying to use the wrong type of drive for a Raid configuration. 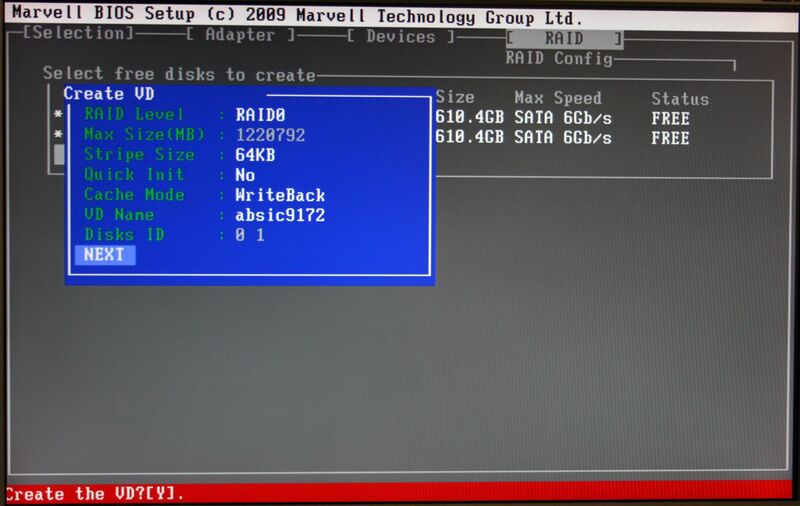 The Marvell 98SE9172 chipset is a totally different beast to its predecessor though and I have to say I am impressed with the relative ease of setting up the RAID0 Array and in how it has been working. 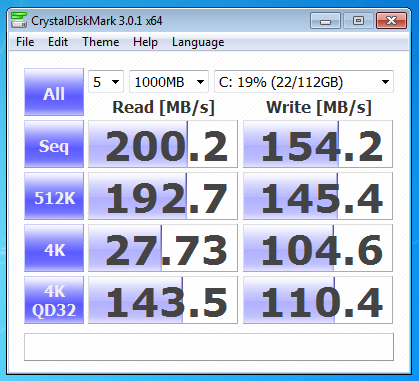 The read/write speeds are better than those of the AMD SATA controller and is just as stable. It does however, have some limitations. You can only use RAID0 or RAID1 which may cause some issues if you have a disk failure. It is also a little harder to setup than the AMD SATA RAID controller which automatically recognises and assigns your hard drives for you. But overall I have to admit to being won over and as an option to improve throughput of information on the PC I can’t really fault it. Of course, I have only been able to test with mechanical hard drives and the real proof of the pudding would be how well the controller works with SSD’s but, as it stands, it seems to do what it says on the box and you really can’t ask for anything more. OK, I have finally decided to come out of the dark ages and invest in a couple of SSD's for my PC. 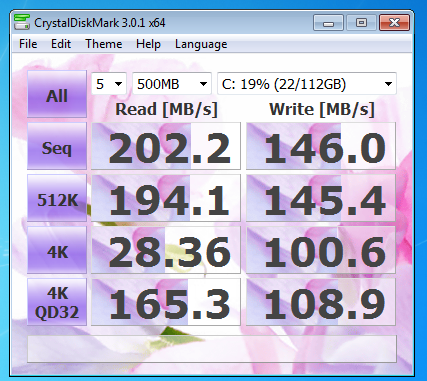 I got hold of two ADATA 60GB S511 SATA 6Gb/s drives which claim to have read/write speeds of up to 550MB/s for read and 500 MB/s for write. Now, before I go any further I have to admit that my knowledge of SSD's and how well they perform has been limited to what I have read and to the one system (my son's) that I built and never got to play with as he ran off with it as soon as I had put it together for him, although he is very pleased with it. Before embarking on testing I did a lot of research and with a little bit of a headache from all the reading I had done, set about reconfiguring my system. 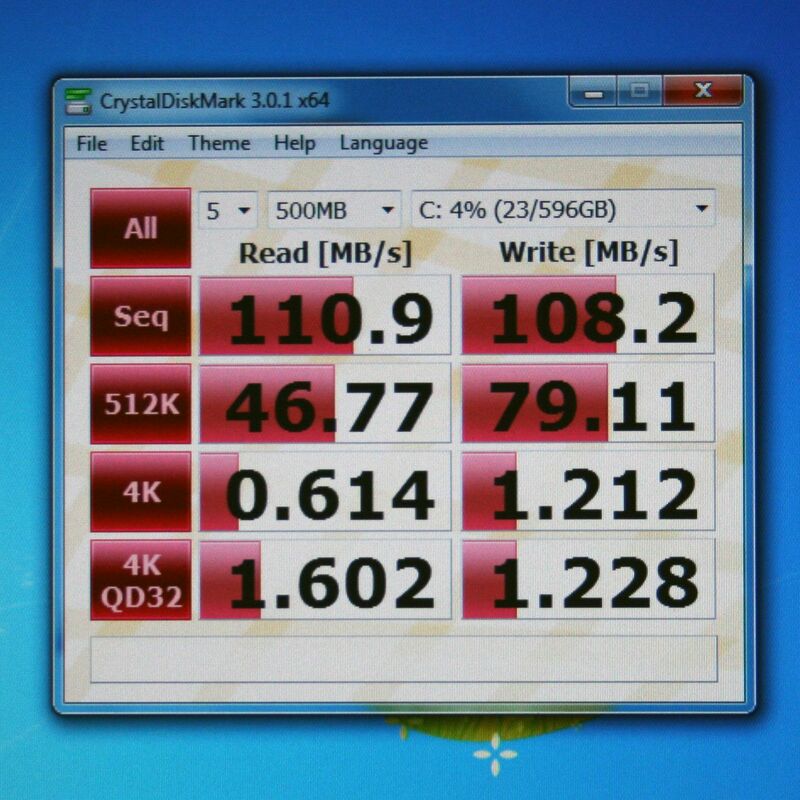 The first test I did was using a single SSD in AHCI Mode on the AMD 950 SATA Controller. I installed the OS (Windows 7 Ultimate SP1 64 bit) and the motherboard drivers but I left the actually AHCI drivers as the Windows default Microsoft version. 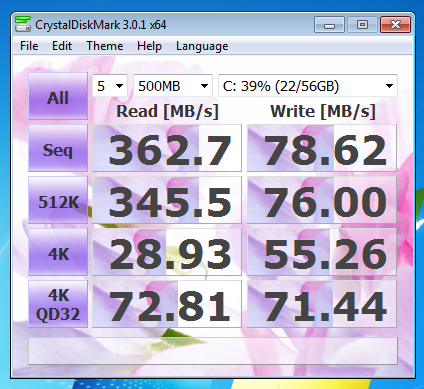 For testing the read/write speeds I used CrystalDiskMark 3.0.1 x64 software. As you can see from the above images I got a really good read speed of about 450MB/s but I was surprised by how low the read figures were. 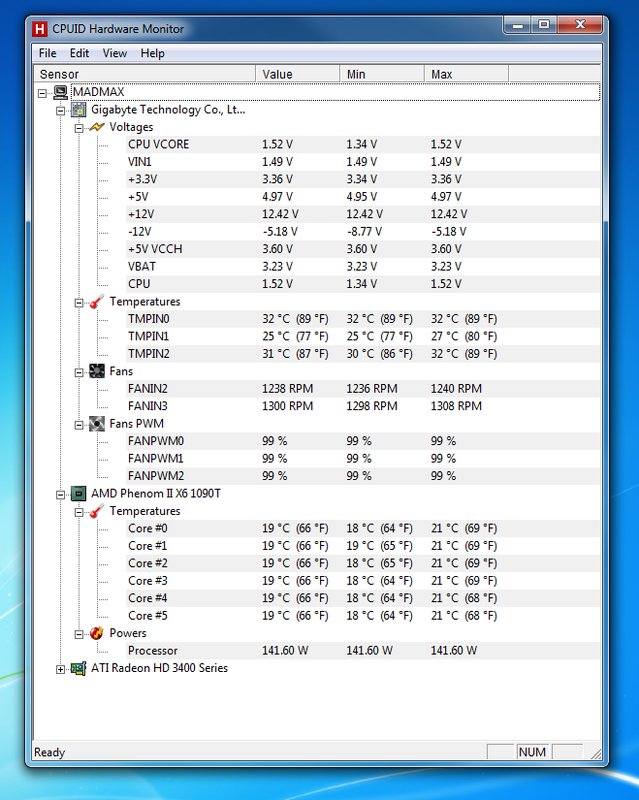 I then installed the AMD AHCI Drivers and re ran the same tests. This time the read speed had gone up to approximately 465MB/s but the write speeds had dropped a little. I then ran Bootracer just to see how quickly the system booted and got back a pretty impressive 11 seconds. The figures for Bootracer were the same with either driver. Having tested the AMD ports in AHCI Mode I then reconfigured the PC for the Marvell Controller, reinstalled the OS and drivers and went through the same tests again. 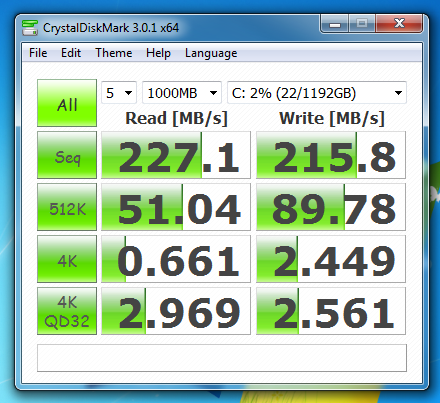 1000MB read/write test Marvell 9172 Controller with Microsoft AHCI driver. 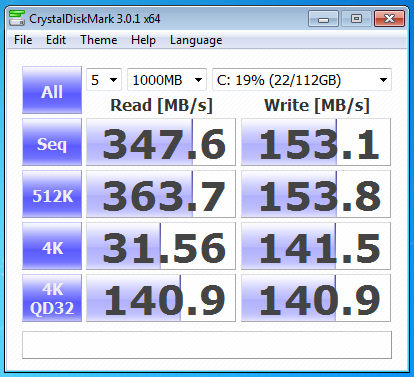 500MB read/write test Marvell 9172 Controller with Microsoft AHCI driver. The figures that came back showed a drop of about 100MB/s for the read test but the write figures stayed around the same as for the AMD Controller. 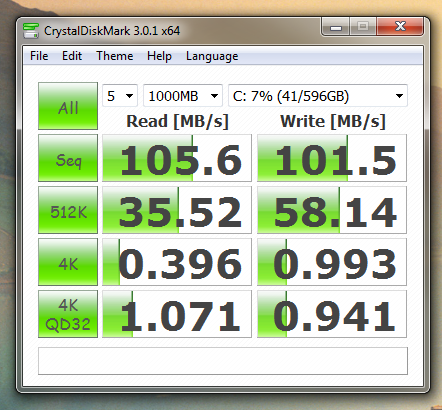 I then installed the Marvell AHCI Driver and re-ran the same tests. 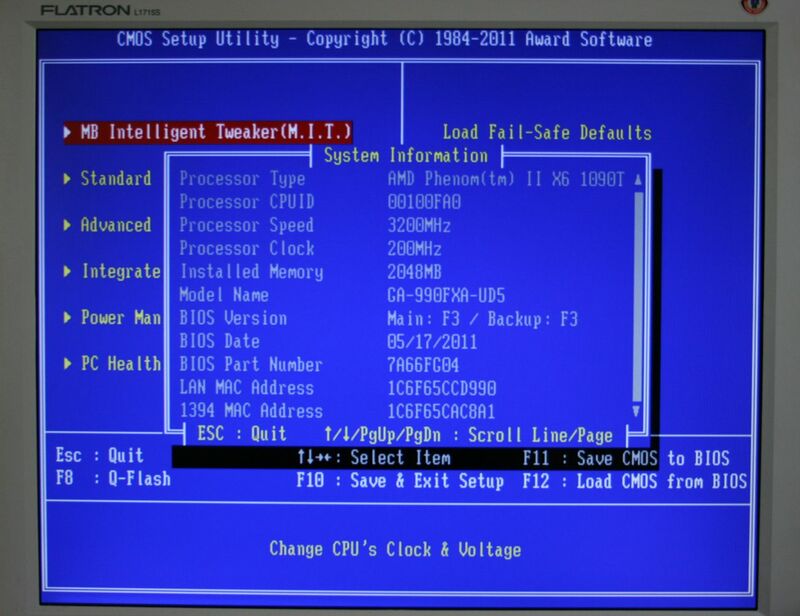 1000MB read/write test Marvell 9172 Controller with Marvell AHCI driver. 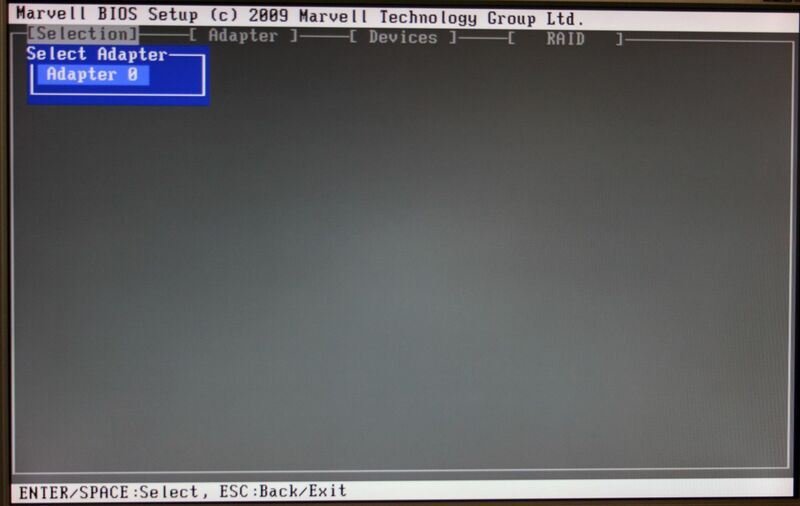 500MB read/write test Marvell 9172 Controller with Marvell AHCI driver. As you can see, there was a dramatic drop on the read performance, almost 200MB/s, at one point, over the AMD Controller. The write speeds though, stayed pretty much the same. A quick run of Bootracer showed that the system took 2 seconds longer to BOOT. 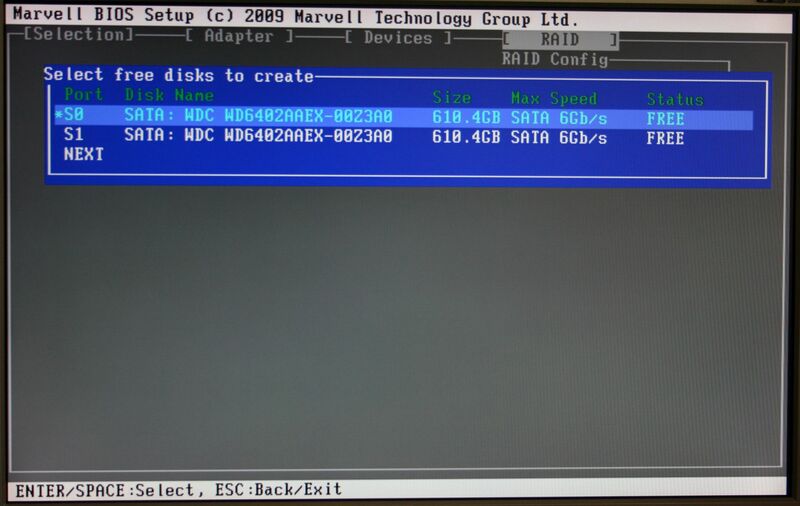 Having now discovered how a single SSD was running on both SATA controllers I next tested how the two drives worked in a RAID0 Array. Once again, after reconfiguring the PC and BIOS for RAID on the AMD Controller I reinstalled the OS and drivers and set about testing things again. 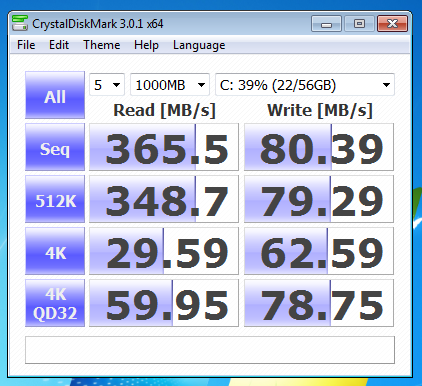 1000MB read/write test RAID0 AMD Controller with Microsoft AHCI driver. 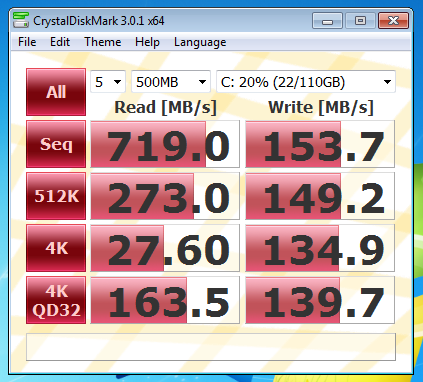 500MB read/write test RAID0 AMD Controller with Microsoft AHCI driver. The read speed increased to about 720MB/s and the write speeds went up to around 160MB/s. This was pretty much what I was expecting given the figures for a single drive. I then installed the AMD AHCI Drivers and tested things again. 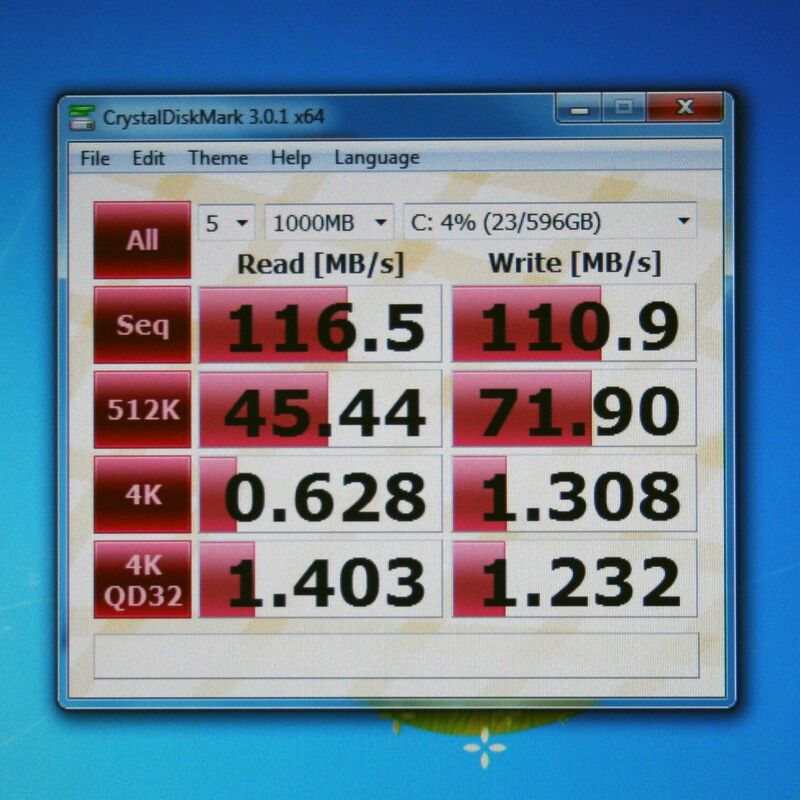 1000MB read/write test RAID0 AMD Controller with AMD AHCI driver. 500MB read/write test RAID0 AMD Controller with AMD AHCI driver. 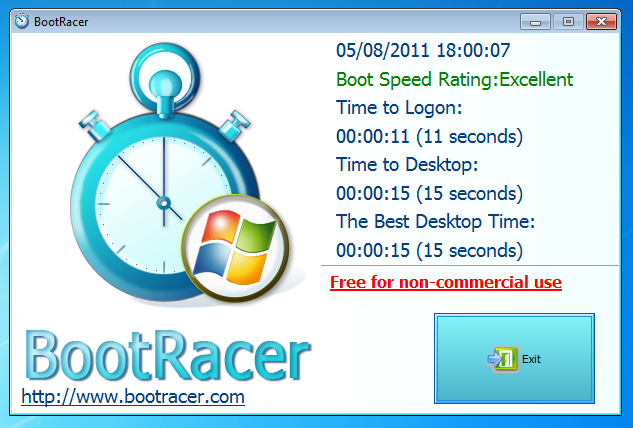 Bootracer also showed that it actually took a little longer to get things started. With a one second difference between the two drivers. 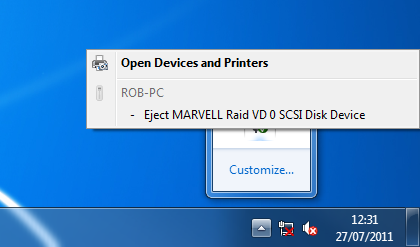 After burying my head inside the PC case once more I was ready to test the Marvell Controller in RAID0. A clean install of the OS to keep things even and I was ready to see what figures this controller delivered. 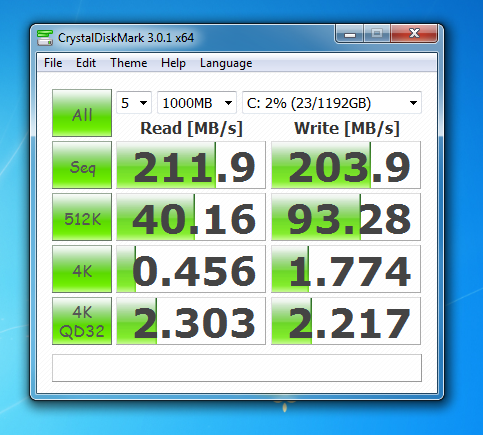 1000MB read/write test RAID0 Marvell SATA Controller with Microsoft AHCI driver. 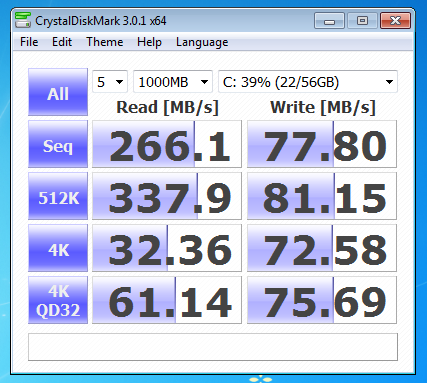 500MB read/write test RAID0 Marvell SATA Controller with Microsoft AHCI driver. To say I was shocked with these figures would be an understatement, I practically fell off of my chair. 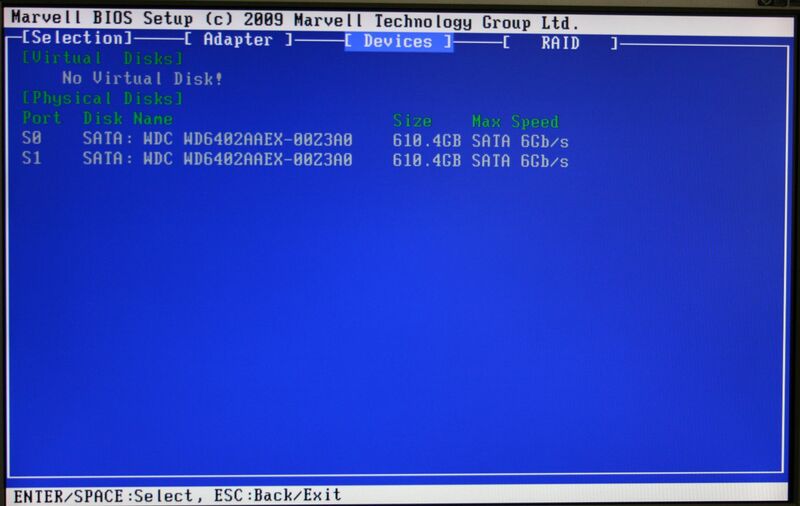 In fact, I was so surprised that I actually went back, erased the SSD's and went through the whole process of installing everything again and re-running the tests..... No mistake, these are the figures the Marvell controller returned in a RAID0 configuration. 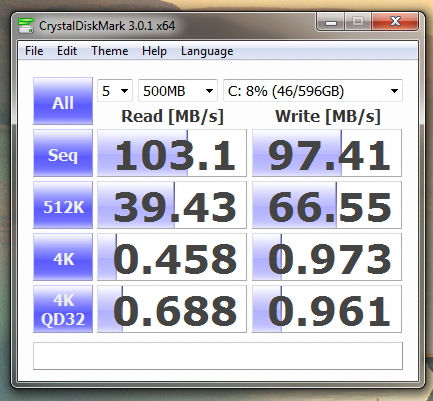 OK, I thought, maybe things will be better with the Marvell drivers installed. But, I was bitterly disappointed, the figures were even worse! 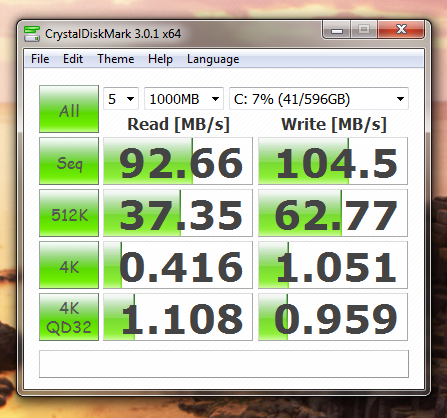 1000MB read/write test RAID0 Marvell SATA Controller with Marvell AHCI driver. 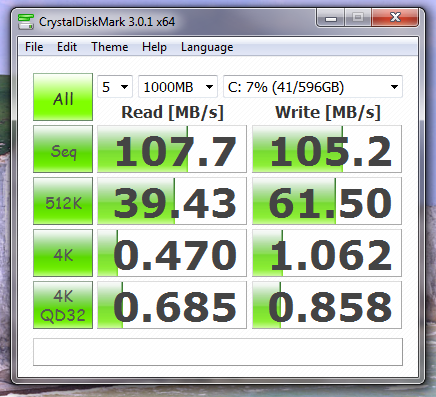 500MB read/write test RAID0 Marvell SATA Controller with Marvell AHCI driver. Running Bootracer showed that despite the lower figures the system actually booted quicker than it did when using the AMD controller. 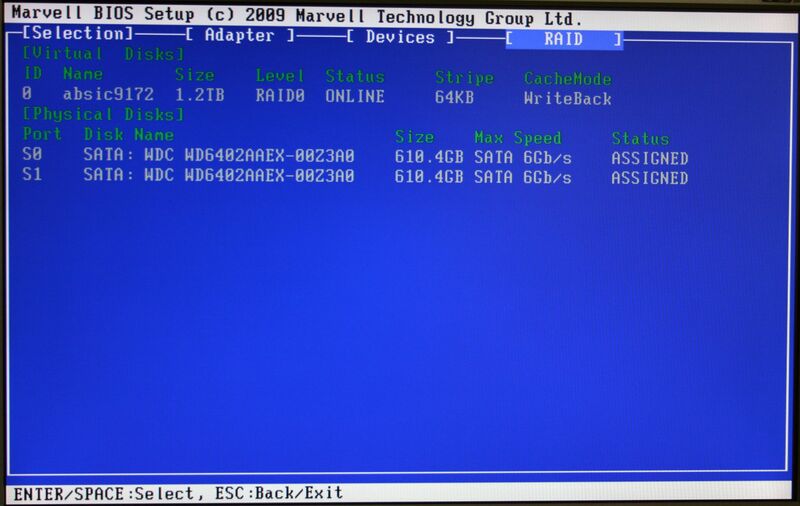 And, despite the low read/write figures when using the Marvell Drivers it actually booted the quickest with this setup in RAID0. I should also point out that I did try a clean install of the OS a third time and double checked that I had installed the correct Marvell drivers using F6 during the OS install. However, the test results were still the same. 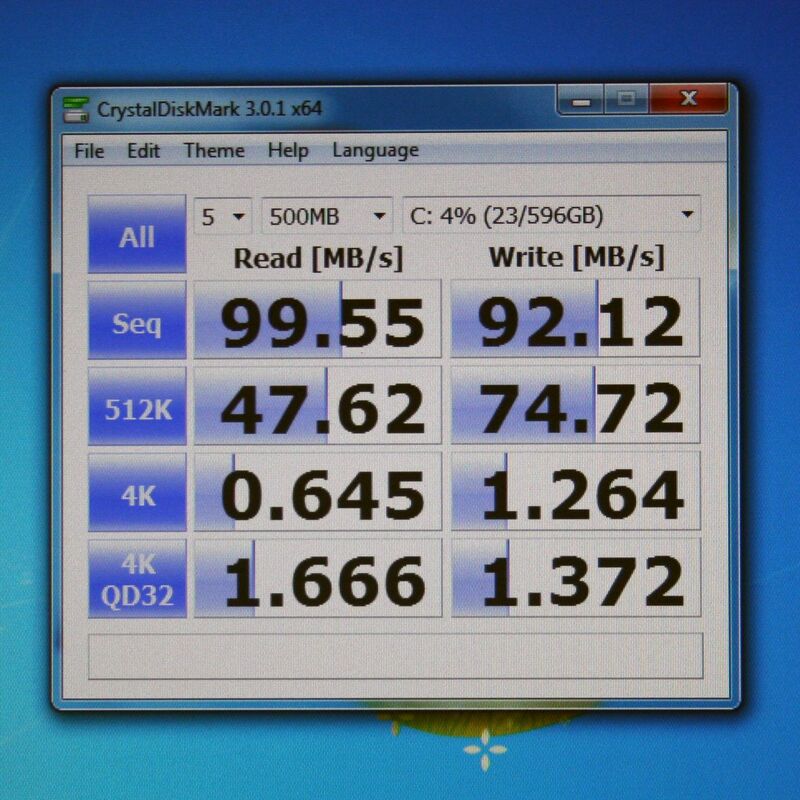 As I said at the very beginning of these tests, I am a newbie when it comes to using SSD's and I could have made an error somewhere along the way although I don't believe I have done so. Also, I am not working in some test facility but in the real world, as a home user, so I would expect my results to be pretty much what the average user will be getting. Also bear in mind that the choice of SSD, their read/write capabilities and the actual capacity of the drive will have a bearing on the results achieved, with larger capacity drives often returning better figures. With that said, with Solid State Drives now coming down in price, to a level that is making them a viable option the question of the performance gain by investing in one or two is becoming one that is being asked regularly. As you can see from the testing I have done the speeds are much improved over a traditional mechanical hard drive but the with some reservations. 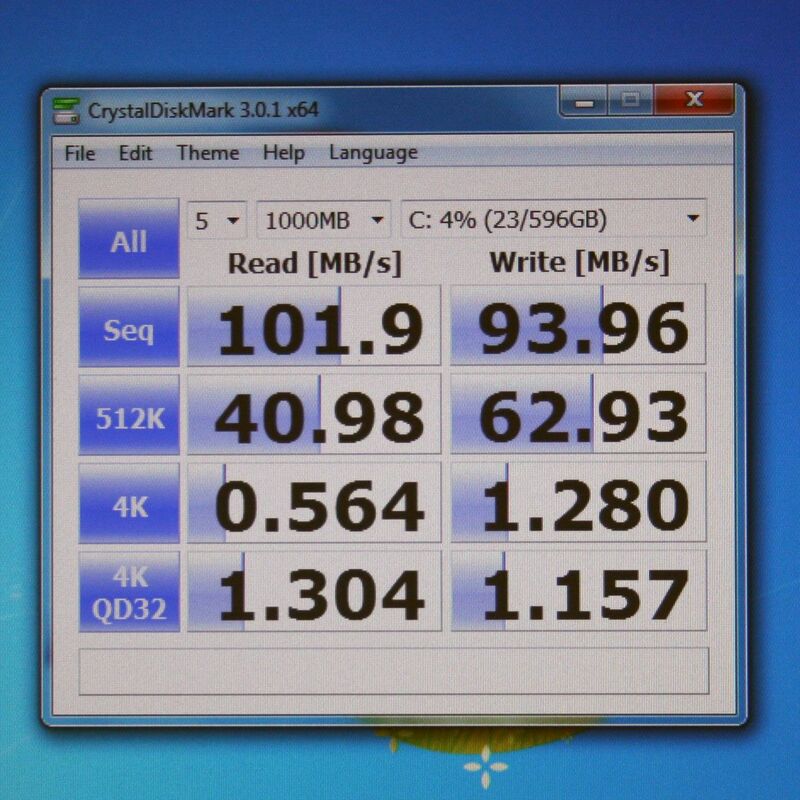 As I previously stated the read/write capabilities of SSD's vary, depending on the size of the drives, the chips used in them and of course, the PC platform. With the GA-990FXA-UD5 I had hoped for a better return from my investment, especially when it comes to the write figures being so low compared to their possible speed. This is down primarily to the drivers and it seems strange that, after all of this time, AMD and Marvell still lag behind the 2006 Microsoft AHCI Drivers. 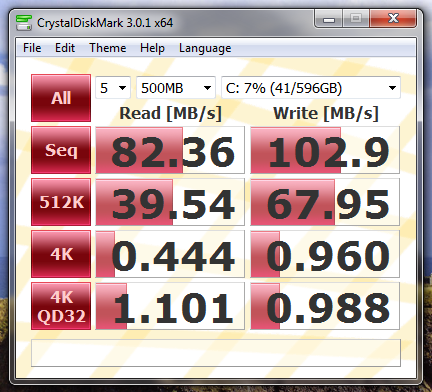 I have reconfigured my PC and am now running the OS on a RAID0 array using the AMD SATA Controller and the Microsoft AHCI drivers as this gives the best overall read/write figures. The Marvell GSATA ports leave a lot to be desired and in my opinion are best left alone, or used as I am doing, in Native IDE Mode for my DVD Burner. I had high hopes for this feature, especially after the debacle of the Marvell 9128 chips on earlier boards but it seems to me as if nothing has improved and average read figures of 200MB/s and write of 154MB/s in a RAID0 array leave a bad taste in the mouth which will not easily be got rid of. 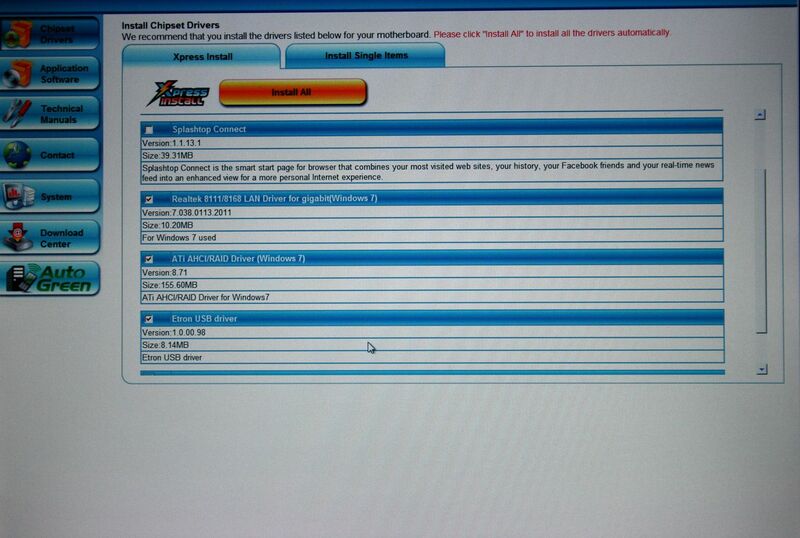 Come on Marvell, get your act together and write some decent drivers for this chipset! 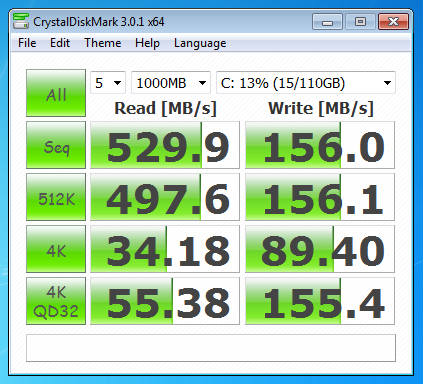 If you can afford a large enough single SSD then, using the AMD SATA controller, along with the Microsoft AHCI Driver is probably going to give you the best overall system boost. If, like me, you get hold of a couple of smaller capacity SSD's then a RAID0 Array on the AMD Controller and again using the Microsoft AHCI Drivers will probably give you the best returns. not sure what you are referring to when you say the IPMI Connector. 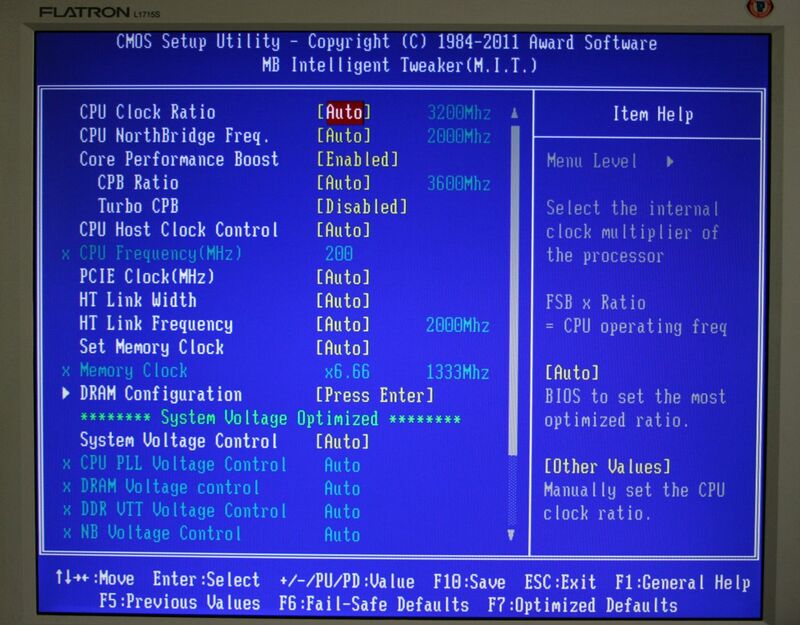 Are you talking about the TPM (Trusted Platform Module) header on the motherboard? Hey nice review so far absic. I will look forward to the coming installments. What is so big about the TPM anyway ? 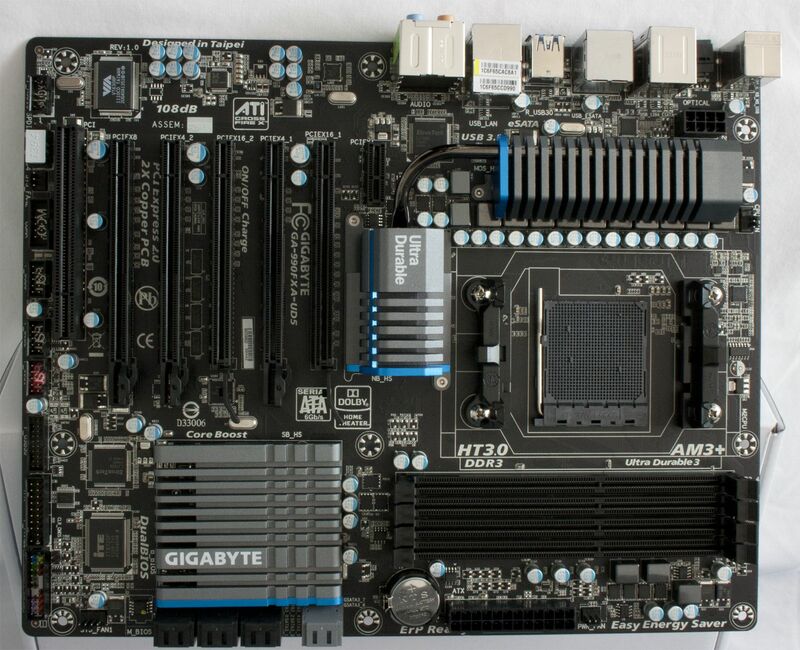 It isn't exactly new and has been an option on many motherboards before. I am just surprised it never really took off in a big way before. Looks a nice board though and especially in black. Should make a lot of people happy along with the SLI support. Ah so it's TPM not IPMI! BTW absic have you already run this board? 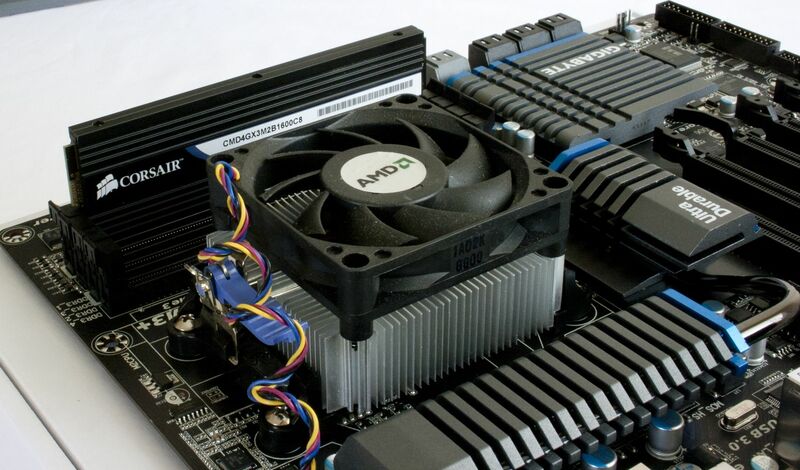 If yes, how cool is it under load - the VRM, the NB heatsink, the board itself? Yes, I am actually testing this board and writing the review now and will be adding such details as Temperatures, Voltages, Overclocking capabilities etc as the review progresses. 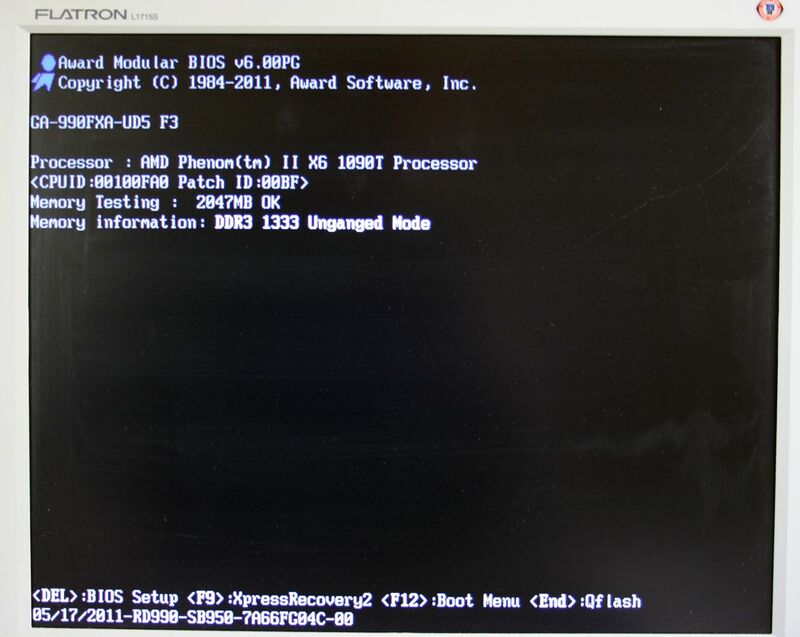 But so far it does seem to be much cooler than the GA-890FXA-UD5 (Rev 2.1) motherboard I was running before. But that could just be because it is much cooler where I am than it was a few days ago!